本发明公开了执行测量的方法和设备。 The present invention discloses a method and apparatus for performing measurements. 这里公开的用于用户设备(UE)执行测量的示例方法包括：从网络接收配置信息，所述配置信息用于配置UE在空闲模式下执行对测量的记录；在空闲模式下记录测量；以及发送所记录的测量可用的指示。 For example methods disclosed herein a user equipment (UE) to perform measurements comprising: receiving configuration information from the network, the configuration information for configuring the UE to perform measurements of the record in an idle mode; record measurements in idle mode; and transmitting the recorded measurement instruction is available. 本公开总体上涉及测量报告，更具体地，涉及执行测量的方法和设备。 It relates to the measurement report  The present disclosure generally, and more particularly, to a method and apparatus for performing measurements. 当前，移动通信网络运营商通常连续地或至少频繁地执行路测，以收集网络性能度量。  Currently, mobile communication network operator typically measured continuously or at least frequently executed path to collect network performance metrics. 近来，第三代伙伴计划（3GPP)已经开始研究最小化路测(MDT)框架，其中可以从在网络中操作的商用用户设备(UE)收集至少一些路测测量，而不需要专门路测。 Recently, the Third Generation Partnership Project (3GPP) has started research MDT (MDT) framework, which can collect at least some of the drive test measurements from a commercial user equipment (UE) operation in the network, without the need for special road test. 通过使用MDT框架，可以减少严格路测的需要和数目，这可以显著降低运营商的网络维护成本，还可以减少碳排放，从而有助于保护环境。 By using MDT framework, it can reduce the need for strict and the number of road test, which can significantly reduce the operator's network maintenance costs, but also reduce carbon emissions, thereby helping to protect the environment. 此外，通过减少对单独路测的依赖，可以实现更快的优化循环，从而得到更高的客户满意度。 Further, by reducing reliance on the individual road test, the optimization cycle may be faster, resulting in higher customer satisfaction. 此外，MDT框架将使得运营商能够从在路测期间通常无法接近的区域(例如窄路、森林、私有地、住所和办公室等等)收集测量。 In addition, MDT framework will enable operators to collect measurements from during the road test is usually inaccessible area (eg narrow road, forests, private land, home and office, etc.). 图1是能够支持这里描述的方法和设备以执行MDT测量的示例3GPP通信系统的框图。  FIG. 1 is a method and apparatus capable of supporting a block diagram of an example described herein MDT measurement 3GPP communication system to perform. 图2是用于实现图1的3GPP通信系统中的MDT测量的示例MDT用户平面架构的框图。  FIG. 2 is a block diagram illustrating a user plane architecture MDT MDT measurement 3GPP communication system of FIG. 1 is achieved. 图3是用于实现图1的3GPP通信系统中的MDT测量的示例MDT控制平面架构的框图。  FIG. 3 is a block diagram for implementing the exemplary architecture plane MDT measurement 3GPP communication system of FIG. 1 MDT control. 图4是支持图3的MDT控制平面架构的示例UE的框图。  FIG. 4 is a block diagram of an example of a UE supporting MDT control plane of FIG. 3 architectures. 图5是支持图3的MDT控制平面架构的示例网络单元的框图。  FIG. 5 is a block diagram of an example network element control plane in FIG. 3 MDT architecture support. 图6是表示可以执行以实现图4的UE中的MDT处理的示例过程的流程图。  FIG. 6 shows an example process to implement the processing MDT UE in FIG. 4 flow chart can be executed. 图7是表示可以执行以实现图5的网络单元中的MDT处理的示例过程的流程图。  FIG. 7 shows an example process to implement the network MDT processing unit of FIG. 5 is a flow chart may be performed. 图8A-B-起是表示可以执行以实现图4的UE中的MDT驻留测量的示例过程的流程图。  From FIGS. 8A-B- is a flowchart illustrating an example process to implement the UE of FIG. 4 resides MDT measurement can be performed. 图9是示意了使用这里描述的示例方法和设备来标识网络覆盖空洞的框图。  FIG. 9 is a schematic of the example methods and apparatus described herein used to identify a block diagram of the network coverage hole. 图10是表示可以执行以实现图4的UE中的MDT移动性测量的第一示例过程的流程图。  FIG. 10 is a flowchart showing a first example implementation MDT UE mobility measurements of FIG. 4 process may be performed. 图11是表示可以执行以实现图4的UE中的MDT移动性测量的第二示例过程的流程图。  FIG. 11 is a flowchart showing a second example implementation MDT UE mobility measurements of FIG. 4 process may be performed. 图12是表示可以执行以实现图4的UE中的MDT定位测量的第一示例过程的流程图。  FIG. 12 is a flowchart showing a first be executed to implement the example process MDT UE positioning measurements in FIG. 4. 图13是表示可以由图5的网络单元执行以配置图4的UE中的MDT定位测量的示例过程的流程图。  FIG. 13 is a flowchart of an example process to configure MDT UE positioning measurement in FIG. 4 may be performed by the network element of FIG. 图14是表示可以执行以实现图4的UE中的MDT定位测量的第二示例过程的流程图。  FIG. 14 is a flowchart showing a second example implementation of FIG. 4 MDT UE positioning measurements of a process may be performed. 图15是表示可以执行以实现图5的网络单元中的MDT位置请求处理的示例过程的流程图。  FIG. 15 is a flowchart of an example process to implement the network element of FIG. 5 MDT location request processing may be performed. [0 018 ]图16是与图15的流程图所不的过程相对应的不例消息序列图。  FIG. 16 is a flowchart of FIG. 15 is not a process corresponding to the embodiment is not a message sequence chart. 图17是表示可以执行以实现图4的UE中的增强小区标识(ID)定位的示例过程的流程图。  FIG 17 is a flowchart of an example process for enhanced cell identity (ID) UE FIG. 4 positioning may be performed. 图18是表示可以执行以实现图4的UE中的全球定位系统(GPS)/全球导航卫星系统(GNSS)定位的示例过程的流程图。  FIG. 18 is a flowchart of an example process to implement a global positioning system in the UE 4 (GPS) / Global Navigation Satellite System (GNSS) positioning may be performed. 图19是表示可以执行以实现图4的UE中的观察到达时间差(0TD0A)定位的示例过程的流程图。  FIG. 19 is a flowchart showing an example process of FIG. 4 in order to observe the UE implementation time difference of arrival (0TD0A) positioning may be performed. 图20是表示可以执行以实现图4的UE中的室内MDT测量过滤的示例过程的流程图。  FIG. 20 is a flowchart illustrating an example procedure implemented to MDT measurement chamber of FIG. 4 in the UE may perform filtering. 图21是表示可以执行以实现图4的UE中的驱车模式MDT测量过滤的示例过程的流程图。  FIG. 21 is a flowchart of an example process to implement drove MDT measurement mode UE of the filter of FIG. 4 may be performed. 图22是可以执行示例机器可读指令的示例处理系统的框图，所述机器可读指令用于实现图6、7、8A-B、10-15和17-21的过程中的一些或全部，以实现图4的UE、图5的网络单元和图1的3GPP通信系统中的任一、一些或全部。  FIG. 22 is a block diagram of an example of machine may perform processing system readable instructions, the machine-readable instructions for implementing FIG 6,7,8A-B, a number of processes 10-15 and 17-21 in or all of, to achieve a UE of FIG. 4, a 3GPP communication system of any of the network elements of FIG. 5 and FIG. 1, some or all. 图23示意了利用激活和去激活阈值来激活和去激活图4的UE中的MDT测量的示例。  FIG. 23 illustrates an example of the use of activation and deactivation thresholds to activate and deactivate the MDT measurement in the UE of FIG. 这里公开了在下一代网络中执行测量以最小化路测的方法和设备。  Disclosed herein are methods and apparatus for performing measurements in the next generation network to the MDT. 尽管以下公开了示例方法和设备，包括在硬件上执行的软件以及其他组件，但是应注意，这些方法和设备仅是示意，不应认为是限制。 Although the following discloses example methods and apparatus, and other components including software executed on hardware, it should be noted that these methods and apparatus are merely illustrative and should not be regarded as limiting. 例如，可以想到，这些硬件和软件组件中的任一或全部可以完全以硬件、完全以软件、完全以固件或以硬件、软件和/或固件的任何组合来实现。 For example, it is contemplated that any one of these hardware and software components or all may be entirely in hardware, entirely in software, firmware, or entirely in hardware, software / firmware or any combination to achieve. 此外，尽管结合使用下一代移动通信网络、接入点和其他网络结构和设备的示例实现来描述，但是这里描述的示例方法和设备不限于此。 Further, although the combination with the next-generation mobile communication network, the exemplary access points and other network devices and structures described implementations, but the example methods and apparatus described herein are not limited thereto. 相应地，尽管以下描述了示例方法和设备，但是本领域普通技术人员容易认识到，所提供的示例不是实现这些方法和设备的唯一方式。 Accordingly, while the following describes example methods and apparatus, those of ordinary skill in the art readily recognize that the examples provided are not the only way to achieve such methods and apparatus. 这里描述的示例方法和设备可以用于实现用于执行MDT测量以及执行MDT定位测量(也称为MDT位置测量)的各种技术，以确定定位(位置)信息以包括或与其他MDT测量相关联。  The example methods and apparatus described herein may be used to implement the various techniques for performing MDT MDT measurement and performing positioning measurements (also referred to as position measurement MDT) to determine the location (position) or to include other information MDT the associated measurement. 在高层，这里采用的示例技术涉及一种网络单元，配置在通信网络中操作的UE以执行MDT测量，所述MDT测量与UE所执行以支持传统网络操作的传统测量总体上分离，使得网络能够确定网络性能并检测潜在问题区域，而无需单独路测。 At the top, the example techniques employed herein relates to a network unit configured to operate in a communication network UE to perform MDT measurement, the UE and the MDT measurement performed in a conventional network operating on a conventional support generally measuring separation, enables the network to determining network performance and detect potential problem areas, without a separate drive tests. 网络向UE提供的MD頂S置信息的示例包括但不限于:MDT测量激活和去激活准则、MDT报告准则、MDT位置请求准则等等，其示例在以下予以更详细的描述。 Examples of network provided to the UE MD Top S configuration information include, but are not limited to: MDT measurement activation and deactivation criterion, the MDT reporting guidelines, the MDT location request criteria and the like, examples of which are the following be described in more detail. 在接收到MDT配置信息时，根据这里描述的一个或多个示例方法和设备实现的UE可以执行MDT测量，并确定由接收的MD頂S置信息配置的其定位/位置。 Upon receiving the MDT configuration information, UE according to one or more example methods and apparatus described herein may be performed to achieve the MDT measurement, and is determined by the top MD positioned opposite the received S / configuration of the position information. 此外，这里描述的示例方法和设备使得商用（例如用户或订户所有的)UE能够执行MDT测量，而不需要测试设备UE或其他专用UE来执行通信网络中的MDT测量。 Further, the example methods and apparatus described herein so that the commercial (e.g., all of the user or subscriber) UE MDT measurement can be performed without requiring dedicated test equipment UE or another UE performs MDT measurement in a communication network. 在这里公开的用于在下一代移动通信网络中执行MDT测量（如周期性下行链路导频测量）的示例技术中，商用UE从配置信息中获得用于MDT测量的激活条件和去激活条件， 以配置MDT测量，所述配置信息是从网络单元接收的。  In the disclosed herein for performing MDT measurement (e.g., periodic downlink pilot measurement) is an example technique in the next generation mobile communication network, the UE obtains the commercial conditions for the activated MDT measurement configuration information from and deactivation conditions to MDT measurement configuration, the configuration information is received from the network element. 然后，商用UE基于激活条件和去激活条件来执行MDT测量。 Then, based on the activation conditions and commercial UE deactivation conditions MDT measurement is performed. 在这里公开的用于配置MDT测量(如周期性下行链路导频测量)的相关示例技术中，网络单元将用于MDT测量的激活条件和去激活条件包括在要发送至商用UE的配置信息中以配置MDT测量。 Activation condition and a deactivated condition disclosed herein related art example for MDT measurement configuration (e.g., periodic downlink pilot measurement), the network unit comprising the MDT measurement configuration information to be transmitted to the UE commercial to configure MDT measurement. 如以下详细描述的，激活条件的示例包括但不限于：阈值、接入类别、定位能力、测量概率因子等等。 As an example, the activation conditions described in detail below include, but are not limited to: a threshold value, access type, positioning capabilities, measurement probability factor and the like. 此外，如以下详细描述的，去激活条件的示例包括但不限于：阈值、持续时间等等。 Further, the example as described in detail below, the deactivation conditions include, but are not limited to: a threshold, the duration and the like. 在至少一些示例实现中，MDT配置信息可以包括一个或多个报告准则以决定商用UE是否要向网络报告所确定的MDT测量。 In at least some example implementations, MDT configuration information may include one or more MDT measurement reporting criteria to decide whether the UE would like commercial network identified in the report. 如以下更详细描述的，这种MDT报告准则的示例包括但不限于:事件标识(如，覆盖外、受限驻留、寻呼信道(PCH)失败、广播控制信道(BCCH)失败等等）以及其他触发条件，如报告概率因子、报告范围（例如所需停用持续时间范围）等等。 As described in more detail below, such an example MDT reporting criteria include but are not limited to: an event identifier (e.g., an outer cover, limited camping, a paging channel (PCH) fails, the broadcast control channel (BCCH) failure, etc.) as well as other triggers, such as reporting probability factor, the report range (for example, required outage duration range) and so on. 在至少一些操作场景中，商用UE可以被配置为确定其定位(或位置），以用于MDT目的，作为对执行其他MDT测量的补充或备选。  In at least some operating scenarios, commercial UE may be configured to determine its location (or position), for the purpose of MDT, MDT measurement as perform other supplementary or alternatively. 在这里公开的用于执行MDT定位测量(也称为位置测量）的示例技术中，商用UE从配置信息中获得用于MDT定位测量的去激活条件（例如持续时间、阈值或两者），以配置MDT定位测量，所述配置信息是从网络单元接收的。 In the example technique disclosed herein for performing MDT positioning measurements (also referred to as position measurement), the UE obtains the commercial deactivation conditions (such as duration, threshold, or both) from the MDT positioning measurement configuration information to Configuring MDT positioning measurements, the configuration information is received from the network element. 然后，基于激活阈值，在商用UE中激活MDT定位测量，UE基于去激活条件来终止MDT定位测量。 Then, based on the activation threshold, measured in a commercial activated MDT positioning the UE, UE based on a deactivated condition to terminate MDT positioning measurements. 在网络侧的相关示例实现中，网络单元将用于MDT定位测量的去激活条件包括在要发送至商用UE的配置信息中，以配置MDT定位测量;发送配置信息;然后使得基于激活阈值，在商用UE中激活MDT定位测量(例如通过发送合适的控制消息）。 In a related example implementation the network side, the network element for a deactivated condition MDT positioning measurements included in the configuration information to be transmitted to the commercial UE, to configure the MDT positioning measurement; send configuration information; and so on activation threshold, in commercial activated MDT UE positioning measurement (e.g. by sending the appropriate control message). 在这里公开的用于执行MDT定位测量的另一示例技术中，商用UE从网络单元获得配置信息，以配置MDT定位测量，其中配置信息包括以下指示：如果无线条件恶化至阈值以下，则商用UE要请求定位辅助数据。  In another example of the herein disclosed techniques for performing MDT positioning measurements, the UE obtains the configuration information from the commercial network element to configure MDT positioning measurements, wherein the configuration information comprises the following instructions: if the radio conditions deteriorate below a threshold, to request the commercial UE positioning assistance data. 稍后，当无线条件恶化至阈值以下时，UE请求定位辅助数据。 Later, when the radio conditions deteriorate below a threshold, the UE positioning assistance data request. 在网络侧的相关示例实现中，网络单元将指示包括在要发送至商用UE的配置信息中， 以配置MDT定位测量，其中所述指示指示如果无线条件恶化至阈值以下，则UE要请求定位辅助数据。 In a related example implementation the network side, the network element indicating included in the configuration information to be transmitted to the commercial UE, to configure the MDT positioning measurements, wherein the indication indicates if the radio conditions deteriorate below a threshold, then the UE should request for positioning assistance data. 在发送配置信息之后，稍后，响应于从UE接收到针对定位辅助数据的请求(例如在无线条件恶化至阈值以下时由UE发送），网络向UE发送定位辅助数据。 After sending the configuration information, later, in response to a request received from the UE (e.g., sent by the UE when the radio conditions deteriorate below a threshold) for positioning assistance data, the network sends positioning assistance data to the UE. 在这里公开的用于执行MDT定位测量的另一示例技术中，商用UE从网络单元获得配置信息，以配置MDT定位测量，其中所述配置信息包括以下指示:在返回覆盖区时，商用UE 要执行或请求MDT定位测量。  In another example of the herein disclosed techniques for performing MDT positioning measurements, the UE obtains the configuration information from the commercial network element to configure MDT positioning measurements, wherein the configuration information includes the following instructions: when returning coverage area, commercial UE is to perform or request MDT positioning measurement. 然后，当商用UE返回覆盖区时（例如，可以由UE检测为找到合适小区、从BCCH失败恢复、从随机接入信道(RACH)失败恢复等等），UE发起MDT定位测量。 Then, when the commercial UE returns to the coverage area (e.g., can be detected by the UE to find a suitable cell from the BCCH failure recovery, the recovery from a random access channel (RACH) failure, etc. ), UE initiates MDT positioning measurements. 在网络侧的相关示例实现中，网络单元将指示包括在要发送至商用UE的配置信息中，以配置MDT 定位测量，其中所述指示指示在返回覆盖区时，UE要执行MDT定位测量。 In a related example of the network-side implementation, the network element indicating included in the configuration information to be transmitted to the commercial UE, to configure the MDT positioning measurements, wherein the indication indicates when returning coverage area, MDT UE to perform positioning measurements. 然后，网络单元发送配置信息以由商用UE接收。 Then, the network unit transmits the configuration information received from the commercial UE. 已经提出了在MDT测量框架中商用UE要执行的各种MDT测量。  have been proposed various commercial UE MDT measurement to be performed in the MDT measurement frame. 所提出的MDT测量的示例包括:周期性下行链路导频测量、服务小区变为劣于阈值测量、发送功率余量变为小于阈值测量、随机接入失败测量、以及无线链路失败报告。 MDT example of the proposed measurement comprising: periodically measuring downlink pilot, becomes worse than serving cell threshold measurement, the transmission power headroom measurement becomes less than the threshold value, the random access failure measurement, and the radio link failure report. 尽管每个所提出的测量要包括位置信息以使得网络能够确定测量在何处执行，但是仍要定义用于确定这种位置信息而不会不当影响UE的电池寿命、使用无线通信资源、导致核心网延迟等等或其任何组合的技术。 Although the measurement of each proposed to include location information to enable the network to determine where to perform the measurement, but still defining such position information is used to determine without undue impact on battery life of the UE, using the wireless communication resources, resulting in the core network delays, etc., or any combination of techniques. 与这些提议不同，这里公开的示例方法和设备实现具有指定激活、去激活和其他操作条件的位置确定技术，所述条件减小对UE电池寿命的影响，减少无线通信资源的使用，并限制接入网核心网的需要。 And various proposals, the example methods and apparatus disclosed herein having a specified achieve activation, deactivation and other operating conditions of the position determination techniques, conditions of reduced impact on the UE battery life, reduce the use of wireless communication resources, and limit then require network core network. 此外，现有所提出的测量(如服务小区变为劣于阈值测量)不足以捕捉许多网络问题场景(如小区之间的往复）、或需要大量记录（以及对UE存储器的相关影响）来获得充足的数据以表征问题场景、或两者兼有。  Further, the proposed prior measurements (e.g., serving cell becomes worse than threshold measurement) is insufficient to capture many scenarios network problems (e.g., reciprocating between cells), or require a large number of records (and the associated effects on memory of UE ) to obtain sufficient data to characterize the problem scenarios, or both. 相反，这里公开的示例方法和设备通过指定激活、去激活和其他操作条件来修改例如周期性下行链路导频测量的配置和执行，以实现对这些网络问题场景中的至少一些的高效捕捉。 In contrast, the example methods and apparatus disclosed herein designated by the activation, deactivation and other operating conditions, for example, to modify a periodic downlink pilot measurement configuration and perform, to achieve efficient capture of at least some of these network problems in the scene. 在至少一些示例实现中，这里采用的方法和设备采用从网络至UE信号通知的信息单元(IE)来配置MDT测量和记录/报告。  In at least some example implementations, the methods and apparatus employed herein uses the information element (IE) signaled from the network to the UE configures MDT measurement and recording / reporting. 概括地说，这些MDT IE可以被分为至少以下3组：（1) 测量激活和去激活准则；⑵报告准则；以及(3)位置请求准则。 Broadly speaking, the MDT IE can be divided into at least the following three groups: (1) measuring the activation and deactivation criteria; ⑵ reporting criteria; and (3) the location request criteria. 在传统3GPP系统中，测量请求仅适用于连接模式的UE，在从网络接收到相关联测量请求时，UE-般需要执行特定测量。 In a conventional 3GPP system, the measurement request applies only to a connected mode UE, upon receiving from the network to an associated measurement request, as the UE-specific measurements need to be performed. 相反，这里采用的MDT测量激活和去激活准则可以用于将特定MDT测量的执行延迟直到UE可能正在经历所关注的网络条件(例如覆盖外条件）。 Instead, MDT measurement employed herein activation and deactivation criteria may be used to perform specific MDT measurement until the UE may delay the network is experiencing conditions of interest (e.g., conditions of coverage). 例如，如果满足任何一个或多个所配置的激活准则，则可以激活MDT测量;或者备选地，MDT测量激活可能需要满足所有激活准则。 For example, if the activation criteria in any one or more configured satisfied, MDT measurement may be activated; or alternatively, MDT measurement activation may need to meet all the criteria to activate. 此外，这里采用的激活和去激活准则允许UE在处于连接模式时被配置用于MDT测量，但是实际上基于所配置的激活准则、去激活准则或网络提供以指示UE要在哪个状态下（例如空闲模式)执行MDT测量的一个或多个有效状态指示中的任一、一些或全部，在空闲模式下执行MDT测量。 In addition, activation and deactivation criteria employed herein allows the UE is configured for MDT measurement when in connected mode, but in fact is based on the activation criteria configuration, or deactivation criteria for a network provider to indicate in which state the UE (e.g. one, some, or all, MDT measurement performed in the idle mode indicates any of an idle mode) or MDT measurement performed more active. 这里采用的MDT测量激活和去激活准则的示例由表1的部分2中包括的IE示意，在以下予以更详细的描述。 Example MDT measurement activation and deactivation criteria employed herein illustrated by IE included in section 2 of Table 1, in the following be described in more detail. 关于测量报告准则，在传统3GPP系统中，任何测量报告准则一般仅适用于连接模式的UE，并且一般要求UE在从网络接收到报告准则时立即基于报告准则来执行报告。  For the measurement reporting criteria, in the conventional 3GPP system, any measurement reporting criteria generally apply only to the connected mode UE, and the UE is required to perform a general report when the report received from the network based on criteria immediately reporting guidelines. 相反， 这里采用的MDT报告准则适用于连接模式和空闲模式的UE，并包括传统3GPP系统中不存在的报告准则。 In contrast, the MDT reporting criteria employed herein applies to idle mode and a connected mode UE and reporting guidelines including conventional 3GPP system does not exist. 这里采用的MDT报告准则的示例由表1的部分3中包括的IE示意，在以下予以更详细的描述。 Example MDT reporting criteria employed herein comprises a portion 3 of Table 1 IE schematically in the following be described in more detail. 关于这里采用的MDT位置请求准则，这些传统3GPP系统中不存在的准则实现了对网络中的UE所经历的与MDT应用相关的问题的高效标识。 About MDT location request criteria employed herein, these conventional systems do not exist in 3GPP criterion enables efficient application identification associated with the MDT in the network problems experienced by the UE. 这里采用的MDT位置请求准则的示例由表1的部分4中包括的IE示意，在以下予以更详细的描述。 MDT location request exemplary criterion employed herein comprises a portion 4 of Table 1 IE schematically in the following be described in more detail. 在至少一些示例实现中， MDT报告准则、MDT位置请求准则、以及MDT测量激活和去激活准则可以单独和独立配置。 In at least some example implementations, MDT reporting guidelines, MDT location request criteria and MDT measurement activation and deactivation criteria can be arranged individually and independently. 转到附图，图1中示意了能够支持这里描述的MDT测量技术的示例下一代3GPP通信系统100的框图。  Turning to the drawings, FIG. 1 illustrates an exemplary support MDT measurement technique described herein is a block diagram of a communication system 100 of the next generation 3GPP. 通信系统100包括由示例当前(或归属或服务)小区110服务的示例UE 105， 小区110由提供基站功能的网络单元实现，如通用陆地无线接入网(UTRAN)实现中的节点B、 演进UTRAN(E-UTRAN)长期演进(LTE)实现中的演进节点B(eNB)等等。 Exemplary communication system 100 includes a current sample (or home or serving) cell 110 and services UE 105, cell 110 is implemented by a base station unit provides network functionality, such as Universal Terrestrial Radio Access Network (UTRAN) implemented in Node B, Evolved UTRAN (E-UTRAN) LTE evolved node B (LTE) implementations (eNB) and the like. 此外，通信系统100包括示例小区115、120和125，这些小区是当前小区110的相邻小区。 In addition, cells 115, 120 and 100 including exemplary communications system 125, the current cell is a neighboring cell which cell 110. 在所示示例中，相邻小区115、120和125由与实现当前小区110的网络单元不同的一个或多个网络单元实现。 In the illustrated example, the adjacent cells 115, 120 and 125 are implemented by one or more network elements with the current cell to achieve a different network element 110. 如以下进一步详细描述的，移动台105和实现当前小区110的网络单元能够执行这里描述的示例技术，以配置和执行MDT测量。 As described in further detail, the mobile station 105 and implement current network cell unit 110 is capable of performing the example techniques described herein, to configure and execute MDT measurement. 在通信系统100中，UE 105可以对应于任何类型的商用移动台或用户端点设备，如移动电话设备、固定电话设备、个人数字助理(PDA)、智能电话(例如BlackBerry®智能电话)等等。  In the communication system 100, UE 105 may correspond to any type of commercial mobile station user or endpoint device, such as a mobile telephone device, a fixed telephone, a personal digital assistant (PDA), a smart phone (e.g., a smart phone BlackBerry®) and many more. 每个小区110-125可以对应于任何类型的小区，如GERAN小区、UTRAN小区、E-UTRAN 小区等等(其中GERAN指GSM/EDGE无线接入网，GSM指全球移动通信系统，EDGE指GSM增强数据速率演进）。 Each cell 110-125 may correspond to any type of cell, such as a GERAN cell, the cell the UTRAN, E-UTRAN cell and the like (which refers to GERAN GSM / EDGE Radio Access Network, GSM Global System for Mobile communications system refers, EDGE means Enhanced GSM data rate Evolution). 此外，小区110-125中的一些或全部可以是相同或不同类型的小区。 In addition, some or all of the cells 110-125 may be the same or different type of cells. 例如，在图1中，相邻小区115是GERAN小区，相邻小区120是UTRAN小区，相邻小区125是E-UTRAN小区。 For example, in FIG. 1, the adjacent cell 115 is a GERAN cell, the neighboring cell is a UTRAN cell 120, cell 125 is a neighboring E-UTRAN cells. 此外，尽管每个小区110-125被描述为由提供基站功能的单独网络单元实现，但是小区HO-125 中的一些或全部可以由公共网络单元实现。 Further, although each individual cell network element 110-125 is described by a base station for implementing the functions provided, but cells HO-125, some or all of the units may be implemented by a public network. 此外，尽管图1 中仅示意了一个UE 105 和4个小区110-125,但是3GPP通信系统可以支持任何数目的UE 105和小区110-125。 Further, although in Figure 1 only illustrates a UE 105 and four cells 110-125, the 3GPP communication system may support any number of UE 105 and cells 110-125. 在图1所示的示例中，UE 105执行实现当前小区110的网络单元所配置的一个或多个MDT测量。  In the example shown in FIG. 1, UE 105 performs MDT measurement implement one or more currently configured network element 110 of a cell. 这种MDT测量的示例包括但不限于：在3GPP技术报告（TR)36.805，V2.0.0 (2009 年12月）（其全部内容通过引用并入此处）中描述的周期性下行链路导频测量、服务小区变为劣于阈值测量、发送功率余量变为小于阈值测量、随机接入失败测量、以及无线链路失败报告。 Such examples include, but are not limited MDT measurement to: in 3GPP Technical Report (TR) 36.805, V2.0.0 (2009 December 2009) (the entire contents of which is incorporated herein by reference) described a periodic downlink pilot pilot measuring, becomes worse than serving cell threshold measurement, the transmission power headroom measurement becomes less than the threshold value, the random access failure measurement, and the radio link failure report. 简而言之，对于周期性下行链路导频测量，在连接模式、空闲模式或两者下周期性记录无线环境测量，如公共导频信道(CPICH)接收信号码功率(RSCP)、CPICH Ec/No、时分双工(TDD)主公共控制物理信道(P-CCPCH)RSCP和干扰信号码功率（ISCP)、参考信号接收功率(RSRP)和参考信号接收质量(RSRQ)(例如仅在连接模式下）。 Briefly, for periodically measuring downlink pilot, periodically recording a wireless environment measurement, such as a common pilot channel (CPICH) received signal code power (the RSCP) in the connected mode, idle mode, or both, CPICH Ec / No, time division duplex (TDD) primary common control physical channel (P-CCPCH) RSCP and an interference signal code power (ISCP), the reference signal received power (RSRP) and reference signal received quality (the RSRQ) (e.g. only in connected mode under). 对于服务小区变为劣于阈值测量，当测量的服务小区度量变为劣于所配置阈值时，记录如上所述的无线环境测量。 For serving cell becomes worse than threshold measurement, when the measured metric serving cell becomes worse than a configured threshold, the radio environment measurement recorded as described above. 使用测量记录窗口（例如在UE中保存所收集记录的"滑动窗口"）来收集事件发生之前和之后的特定时段期间的信息。 Using the measurement recording windows (e.g. Save "sliding window" record collected in the UE) to collect information before and after the event occurs during a specific time period. 对于发送功率余量变为小于阈值测量，当UE发送功率余量变为小于所配置阈值时，记录如上所述的发送功率余量和无线环境测量。 For the transmission power headroom measurement becomes less than the threshold value, when the UE transmission power headroom becomes less than a configured threshold, the recording power margin and the wireless transmission environment is measured as described above. 对于随机接入失败测量，当发生随机接入失败时，记录关于如上所述的随机接入和无线环境测量的细节。 For the measurement of the random access failure, when the random access failure occurs, the recording details about the wireless environment measurement and random access described above. 对于无线链路失败报告，当发生无线链路失败(RLF)时，报告如上所述的无线环境测量。 For the radio link failure report when the radio link failure occurs (the RLF), the radio environment measurement report described above. 在示例实现中，周期性下行链路导频(PDP)测量可以用于例如通过将UE(例如包括UE 105)随机配置为在特定地理区域中执行rop测量(无论接收信号强度或质量如何），来绘制3GPP通信系统100中的下行链路接收电平。  In an exemplary implementation, the periodic downlink pilot (PDP) may be used, for example, by measuring the UE (including e.g. UE 105) is configured to perform a random rop measurements in certain geographic areas (whether a received signal strength or quality how) to draw the 3GPP communication system 100, the downlink reception level. 为了标识特定覆盖空洞，如果接收信号强度或质量变为劣于一个或多个阈值，则在UE(例如包括UE 105)中激活TOP测量。 In order to identify a particular coverage hole, if the received signal strength or quality becomes worse than the one or more thresholds, then the UE (including e.g. UE 105) is activated TOP measurement. 否则，UE电池和存储空间可能被浪费用于在良好无线条件下测量，这无用于标识覆盖空洞。 Otherwise, the UE battery, and storage space may be wasted for measuring under good radio conditions, which identifies no coverage holes. 其他测量类型(如服务小区变为劣于阈值和发送功率余量变为小于阈值)也可以利用激活阈值。 Other types of measurements (e.g., serving cell becomes worse than the threshold value and the transmission power headroom becomes less than a threshold) may also be used to activate a threshold. 在连接模式下，存在无线资源控制(RRC)连接，网络可以选择目标UE(如UE 105)， 并且使用RRC消息（如测量控制或重新配置消息）来配置MDT测量。  In connected mode, there is a radio resource control (RRC) connection, the network may select the target UE (such as UE 105), and using an RRC message (e.g., reconfiguration or measurement control message) to configure MDT measurement. 关于TOP测量，根据例如网络提供的用于指示在哪个/哪些状态下可以执行MDT测量的一个或多个有效状态指示，这种配置可以在RRC连接释放之后保持有效。 About TOP measured, for example, according to the network provided for indicating at which / state which may perform one or more valid state MDT measurement indication, then this configuration may remain valid in the RRC connection release. 在空闲模式下，可以发送MDT测量的配置信息，作为广播系统信息的一部分。 In idle mode, MDT measurement configuration information may be transmitted as part of the broadcast system information. 在连接模式或空闲模式下，MDT配置信息包括UE105在激活测量之前评估的一个或多个准则或条件，使得在3GPP通信系统100中，仅特定组的UE执行MDT的测量。 In connected mode or idle mode, MDT configuration information includes one or more criteria or conditions UE105 evaluated prior to activating the measurement, so that the 3GPP communication system 100, the UE performs measurement only a specific group of MDT. 这种激活条件包括例如:接入类别、定位能力、测量概率因子等等。 Such conditions include, for example, activation: access category, positioning capabilities, measurement probability factor and the like. 关于定位能力，网络可能想要使用特定定位技术，如全球导航卫星系统(GNSS)定位，以在UE 105遇到覆盖问题时定位UE 105。 About positioning capability, the network may want to use a specific positioning technology, such as Global Navigation Satellite System (GNSS) positioning, when the UE 105 coverage problems encountered locate UE 105. 关于测量概率因子，在示例实现中，如果UE 105抽取的随机数小于（或备选地，大于)概率因子，则UE 105不执行相关联MDT测量。 About measurement probability factor, in an example implementation, if the UE 105 extracts a random number less than (or alternatively, greater than) the probability factors associated with the UE 105 does not perform MDT measurement. 关于接入类别，网络可以限制仅由属于特定指定接入类别的UE来执行MDT测量。 About the access category, the network may be limited only by the UE performs the MDT measurement belonging to a specific category of the specified access. 在示例实现中，当满足所有激活条件时，激活MDT 测量和记录。 In an example implementation, when all conditions are met activation, and activation MDT measurement records. 在另一示例实现中，当满足任一激活条件或激活条件的特定子集时，激活MDT 测量和记录。 In another example implementation, when a particular subset satisfy any of the conditions or activation conditions of activation, and activation MDT measurement records. [00411因此，如以下更详细描述的，3GPP通信系统100中的MDT测量配置可以包括激活条件，如阈值、接入类别、定位能力、测量概率因子等等。 [00411 Thus, as described in more detail, 3GPP communication system 100 MDT measurement configuration may include activating conditions, such as the threshold value, access type, positioning capabilities, measurement probability factor and the like. 此外，为了标识3GPP通信系统100中的覆盖空洞，PDP测量或服务小区变为劣于阈值测量可以配置有去激活阈值。  Further, in order to identify 3GPP communication system in a coverage hole 100, PDP, or the measurement becomes worse than serving cell threshold measurement may be configured with a deactivation threshold. 例如，如果这样配置，如果UE 105的接收信号强度或质量变为劣于所配置激活阈值，UE 105开始MDT测量和记录。 For example, if so configured, if the UE receives 105 the signal strength or quality becomes worse than a configured threshold activation, UE 105 starts MDT measurement and recording. 然而，较差的无线条件可能维持较长时间，或者备选地可能在测量期间改善，使得UE 105不会经历覆盖问题。 However, poor radio conditions may be maintained for a long time, or alternatively may be improved during a measurement, UE 105 does not experience such issues coverage. 因此，在3GPP通信系统100中，在这种情形下，MDT测量可以终止，以节约用户电池电量和存储空间。 Thus, in the 3GPP communication system 100, in this case, the MDT measurement can be terminated, the user to save battery power and storage space. 例如，在3GPP通信系统100中，在至少一些MDT测量配置中包括一个或多个去激活条件。 For example, in the 3GPP communication system 100, at least some of the MDT measurement configuration includes one or more of a deactivated condition. 在示例MDT测量配置中，去激活条件包括测量持续时间以及信号电平或质量阈值。 In an MDT measurement configuration, the deactivation conditions include a measurement duration and a signal level or quality threshold. 此外，在示例实现中， 如果满足去激活条件中的至少一个，则去激活MDT测量和记录。 Further, in the exemplary implementation, if the deactivation conditions are satisfied in at least one of deactivating the MDT measurement and recording. 如果测量持续时间已经过去，或者无线条件穿过所指示的阈值，则UE 105停止MDT测量和记录。 If the measurement duration has elapsed, or radio condition crosses the threshold indicated, the UE 105 stops MDT measurement and recording. 此外，当满足去激活条件时，UE 105可以移除新添加至其存储的MDT测量日志的信息，因为所记录的信息不再有用。 Moreover, when the deactivation condition is satisfied, UE 105 may be removed to the newly added MDT measurement log information stored therein, since the recorded information is no longer useful. 因此，如以下更详细描述的，3GPP通信系统100中的MDT测量配置可以包括去激活条件，如测量持续时间以及信号强度或质量阈值。  Thus, as described in more detail, 3GPP communication system 100 MDT measurement configuration may include a deactivated condition, measuring the duration and the signal strength or quality threshold. 此外，MDT测量配置信息可以包括:在去激活测量时UE(如UE 105)是否要从其MDT测量记录中移除新近MDT测量的指示。 Further, MDT measurement configuration information may include: UE (such as UE 105) upon deactivation indicates whether a measurement is removed from its newly measured MDT MDT measurement records. 此外，当UE(如UE 105)遇到覆盖空洞或失败时（例如，随机接入信道(RACH)或广播控制信道(BCCH)失败），有益地，UE 105可以在情形改善以及UE 105有能力之后立即向网络报告。  Further, when the UE (such as UE 105) encounters a coverage hole or failure (e.g., a random access channel (RACH) or broadcast control channel (BCCH) failure), advantageously, can be improved in the case of UE 105 and UE immediately after the report to the network 105 has the ability. 如果在特定区域中存在许多报告，则运营商可以采取快速动作。 If there are many reports in a particular area, the operator can quickly take action. 因此，MDT测量配置应当包括报告准则，报告准则可以包括涵盖适于MDT报告的失败情况的一个或多个事件标识。 Thus, MDT measurement configuration should include reporting criteria, reporting criteria may include a cover adapted MDT failures reported identification of one or more events. 当满足报告准则中的一个或多个时，UE 105向网络报告。 When satisfy one or more criteria in a report, UE 105 reports to the network. 在示例实现中，如果UE 105处于空闲模式，则UE 105发起RRC连接建立(例如指示目的为MDT报告），使得网络可以收集UE 105 中记录的信息。 In an example implementation, if the UE 105 is in idle mode, the UE 105 initiates an RRC connection setup (e.g., as indicated MDT reporting purposes), so that the network may collect the information recorded in the UE 105. 例如，报告准则可以包括:事件标识(也称为事件描述符），如，覆盖外、受限驻留、PCH失败、BCCH失败等等；以及其他报告触发条件，例如但不限于:具有上限、下限或两者的报告范围（例如所需停用持续时间范围）、报告概率因子等等。 For example, reporting criteria may include: event identification (also referred to as an event descriptor), e.g., an outer cover, limited camping, the PCH failure, like the BCCH failure; other reports and trigger conditions such as, but not limited to: an upper limit, reports lower range limit or both (e.g., required outage duration range), reporting probability factor and the like. 此外，在3GPP通信系统100中，通过配置所需停用持续时间范围和/或其他报告准则，可以实现一个或多个MDT过滤技术，以避免不想要的失败报告，或者至少减少其数目。 Further, in the 3GPP communication system 100, by configuring a required outage duration range and / or other reporting standards, MDT may implement one or more filtering techniques to avoid unwanted failure reports, or at least reduce their number. 例如，运营商可能对研究短期停用或失败(如当用户可能短时(如20秒)处于电梯中时发生)或极长期停用(如当用户可能长时间处于地下室中看电视时发生)不感兴趣。 For example, the operator may (occur such as when a user may short (eg 20 seconds) in the elevator) to study short-term disabled or failure of or very long-term disabled (such as when a user may watch TV a long time in the basement of the event) not interested. 因此，如以下更详细描述的，3GPP通信系统100中的MDT测量配置可以包括指定报告准则，如，事件标识(或描述符）以及其他报告触发条件，所述事件标识可以包括覆盖外、 受限驻留、PCH失败、BCCH失败等等，所述其他报告触发条件可以包括报告范围、报告概率因子等等。  Thus, as described in more detail, the measurement of the MDT 100 3GPP communication system configuration may comprise specifying a reporting criteria, such as, an event ID (or descriptors) reports and other trigger conditions, the event identifier may comprise an outer cover , limited camping, the PCH failure, a failure like the BCCH, the trigger condition may comprise other reports reporting range, reporting probability factor and the like. 此外，当满足所配置的报告准则中的一个或多个并且UE 105指示RRC连接建立时， UE 105可以指示MDT报告作为建立原因。 Further, when one or more configuration satisfies the reporting criteria and the UE 105 is indicative of RRC connection establishment, UE 105 may indicate the establishment cause as MDT report. 总而言之，在3GPP通信系统100中，根据网络所配置的一个或多个有效状态指示， 可以在连接模式和空闲模式下执行MDT的测量配置。  In summary, in the 3GPP communication system 100, configured in accordance with one or more of the active network status indication, MDT measurement configuration can be performed in the idle mode and connected mode. 在连接模式下，网络选择目标UE(如UE 105)，并利用RRC消息（如测量控制或重新配置消息）来配置测量。 In the connected mode, the network selects a target UE (such as UE 105), using an RRC message (e.g., reconfiguration or measurement control message) to configure the measurement. 在空闲模式下，系统信息用于配置MDT测量。 In idle mode, the system configuration information for MDT measurement. 示例MD頂S置信息包括但不限于：（1)激活条件，包括阈值、接入类别、定位能力、测量概率因子等等；（2)去激活条件，包括持续时间和阈值；（3)报告准则，包括事件标识(或描述符）（对应于覆盖外、受限驻留、PCH失败、BCCH失败等等)和触发条件(包括报告范围、定位能力、接入类别和报告概率因子）；（4)如果满足一个或多个报告准则(如果可用） 是立即向网络报告测量还是记录以便随后收集的指示，等等。 Example MD Top S configuration information include, but are not limited to: (1) activation conditions, including a threshold, the access category, positioning capabilities, measurement probability factor and the like; (2) a deactivated condition, including the duration and the threshold value; (3) Report criteria, including event identification (or descriptors) (corresponding to the outer cover, limited camping, the PCH failure, the BCCH failure, etc.) and triggers (including reporting range, positioning capabilities, reporting and access probability factor category); ( 4) If the condition reporting criteria one or more (if available) is measured immediately instructs the recording or collected for subsequent reporting to the network, and the like. 在执行所配置的MDT测量之后，UE 105根据MDT的测量配置，立即报告MDT测量，或将其记录以便随后收集。 After performing the MDT measurement configuration, UE 105 according to the measurement configuration MDT, MDT measurement reports immediately, or be recorded for subsequent collection. 在记录的情况下，UE 105可以被配置为：当根据去激活条件去激活测量或者当不满足报告准则时，移除新近添加至其记录的MDT测量。 In the case of recording, UE 105 may be configured to: when deactivated or when the measurement reporting criteria is not satisfied according to a deactivated condition, to remove the newly added MDT measurement is recorded. 3GPP通信系统100还采用各种技术以获得精确的UE定位信息（也称为位置信息）， 以包括或与例如UE 105报告的MDT测量相关联。  3GPP communication system 100 employ various techniques to obtain precise UE positioning information (also referred to as location information), or to include, for example, MDT measurement report UE 105 is associated. 在示例实现中，为了降低UE功率影响，仅当UE遇到问题时（如进入无覆盖区域)或者UE从问题恢复时，UE执行定位测量(也称为定位过程、位置测量、位置过程等等）。 In an example implementation, the UE in order to reduce the influence of power, only when the UE encounters problems (e.g., into the non-coated area) or the UE from the time the recovery problem, UE perform positioning measurements (also referred to as positioning, position measurement location procedures, etc. ). 当UE遇到问题时激活定位测量的困难在于UE可能需要网络辅助来执行测量，而当UE经历问题时网络辅助不可用。 When the UE positioning measurement activation problems encountered difficulty lies UE may need to perform network-assisted measurements, UE experiencing problems when network-assisted unavailable. 例如，当UE 105经历较差无线条件时，UE 105可能不能接收辅助数据或测量目标小区（例如小区115-125之一)和参考小区（例如小区110)之间的定时差，以进行观察到达时间差(OTDOA)定位。 For example, when experiencing poor radio conditions UE 105, UE 105 may receive assistance data or not the measurement target cell (e.g., one cell 115-125) and the reference cell (e.g., cell 110) the difference between the timing to reach the observation the time difference (the OTDOA) positioning. 为了解决这种困难，在示例实现中，当预期会发生问题时，激活定位测量。  In order to solve this problem, in the exemplary implementation, the problem occurs when it is expected to activate the positioning measurements. 例如，如果下行链路导频信号强度或质量(或要评估的另一配置度量)变为劣于配置的阈值，则在UE 105中激活定位。 For example, if the downlink pilot signal strength or quality (or another configuration metrics to be evaluated) the configuration becomes worse than a threshold, UE 105 is activated in the positioning. 在连接模式下，网络可以使用无线资源管理(RRM)测量来获得UE 105的接收信号功率或质量(或另一度量）；如果无线条件变为劣于阈值，则配置周期性定位测量。 In the connected mode, the network may use the radio resource management (RRM) to obtain received signal power measurement or quality of the UE 105 (or other metric); if the radio condition becomes worse than the threshold value, the periodic positioning measurement configuration. 例如，在UTRAN实现中，服务无线网络控制器(SRNC)可以经由测量控制消息来配置定位测量， 而在E-UTRAN中，增强NodeB(eNB)可以经由移动性管理实体(MME)向增强服务移动位置控制器(E-SMLC)发送定位测量请求。 For example, in the UTRAN implementation, the serving radio network controller (SRNC) can be measured via the measurement control message to configure the positioning, in the E-UTRAN enhanced NodeB (eNB) can be moved to the enhanced service via the Mobility Management Entity (MME) a position controller (E-SMLC) sends a location measurement request. 在空闲模式操作的情况下，MDT测量的配置信息可以在系统信息中提供，并指示例如:如果无线条件变为劣于配置的阈值，则UE 105要发起移动台发起的位置请求(M0-LR)过程;或者UE 105要执行RRC连接建立，指示连接建立的目的是MDT定位，使得网络可以配置定位测量。 Configuration information MDT measurement may be provided in the system information in the case where the idle-mode operation, and indicates, for example: if the radio condition becomes a threshold inferior to the configuration of the UE 105 to initiate a location request to a mobile originated (M0-LR ) process; or UE 105 to perform RRC connection establishment, connection destination indicating MDT positioning is established so that the network can be configured positioning measurements. 为了允许成功配置和执行定位测量，包括辅助数据传送，用于激活定位的阈值应当具有相对于停用水平的充足余量(例如在经历停用之前，提供充足时间来执行定位并传送辅助数据）。  In order to allow a successful configuration and execution positioning measurements, including supplementary data, the threshold for activating the positioning should have a sufficient margin with respect to the deactivation level (e.g., before undergoing deactivation to provide adequate time to perform the transfer and positioning supplementary data). 然而，如果阈值提供过多余量，则由于无线条件可能保持相同或改善UE 105 可能不经历网络所预期的停用问题，从而导致不利地浪费UE电池功率。 However, if the threshold provided too much margin, since the wireless conditions may remain the same or improve UE 105 may not experience problems disabling the network expected, resulting in a waste of UE battery power adversely. 因此，如以下更详细描述的，应当利用例如用于去激活定位测量的接收信号功率和/或质量阈值来限制MDT的定位测量的持续时间。  Thus, as described in more detail in, for example, should be used for deactivating the positioning measurements received signal power and / or quality threshold to limit the duration of the MDT positioning measurements. 因此，在至少一些实现中，3GPP通信系统100中用于MDT定位测量的配置信息包括用于定位测量的去激活条件，如持续时间和阈值。 Thus, in at least some implementations, 3GPP communication system 100 configuration information for MDT positioning measurements including a deactivated condition for the positioning measurements, such as the duration and the threshold value. 附加地或备选地，当无线条件（例如接收)变为劣于阈值时，辅助数据可以传送至UE 105,实际定位测量可以推迟至稍后，如当UE 105移至覆盖外时或UE返回覆盖时。  Additionally or alternatively, when the radio conditions (e.g., receiving) becomes worse than the threshold value, the auxiliary data can be transmitted to the UE 105, the actual measurement can be postponed to a later positioned, such as when UE 105 moves to the outer cover UE or return coverage. 在连接模式下，网络可以使用RRM测量来获得UE 105的接收信号功率或质量，然后向UE 105传送辅助数据。 In the connected mode, the network may use the RRM measurement to obtain a received signal power or quality of the UE 105, then UE 105 transmits data to the secondary. 在UTRAN实现中，SRNC可以传送辅助数据。 In the UTRAN implementation, SRNC may transmit the auxiliary data. 在E-UTRAN实现中，eNB可以请求经由MME 从E-SMLC向UE 105传送辅助数据。 In E-UTRAN implementations, eNB may request assistance data from the MME 105 transmits to the UE via the E-SMLC. 附加地或备选地，MDT测量配置信息还可以包括向UE传送的辅助数据。 Additionally or alternatively, MDT measurement configuration information may further include an auxiliary data transmission to the UE. 附加地或备选地，MDT测量配置信息可以指示:如果无线条件变为劣于配置的阈值，则UE应当利用M0-LR过程来请求辅助数据传送，或者建立RRC连接(使得网络可以在连接模式下传送辅助数据）。 Additionally or alternatively, the MDT measurement configuration information may indicate: if the radio condition becomes worse than the configured threshold, the UE shall use M0-LR procedure to request supplementary data, or establish an RRC connection (connection mode so that the network may the auxiliary data is transmitted). 在空闲模式操作的情况下，MDT的测量配置可以指示:如果无线条件变为劣于阈值，则UE 105应当发起M0-LR过程以请求辅助数据。 In the case where the idle-mode operation, MDT measurement configuration may indicate: if the radio condition becomes worse than the threshold, the UE 105 should initiate M0-LR procedure to request assistance data. 在示例实现中，辅助数据具有有效性信息，例如有效区域和从其产生起的持续时间。 In an exemplary implementation, the auxiliary data with validity information, for example, effective area and duration as from its generation. 在这种示例中，当辅助数据传送至UE 105时，网络可以指示辅助数据的有效性信息，使得UE 105可以在应用辅助数据之前检查辅助数据是否有效。 In such an example, when the auxiliary data is transmitted to the UE 105, the validity information may indicate that the network assistance data, UE 105 may check so that the auxiliary data is valid before applying the auxiliary data. 这种方法的优点是定位测量的较短延迟。 The advantage of this method is that positioning measurements shorter delay. 例如，为了执行GNSS定位，即使UE 105正在经历问题（如覆盖空洞），UE 105仍可以尝试使用预先传送的辅助数据来固定定位测量，以获得问题区域的精确位置。 For example, in order to perform GNSS positioning, even if the UE 105 is experiencing problems (e.g., a coverage hole), UE 105 can still attempt to use the data previously transferred to the secondary fixed positioning measurements, to obtain the precise location of the problem area. 为了执行增强小区标识(E-CID)或0TD0A，UE 105可以在无线条件恢复之后立即开始定位测量。 In order to perform an enhanced cell identity (E-CID) or 0TD0A, UE 105 may begin immediately after the wireless positioning measurement condition for the restoration. 然而，为了提供合适的辅助数据，无线网络需要预先知道UE定位能力。 However, in order to provide appropriate assistance data, the wireless network needs to know in advance the UE positioning capability. 在UTRAN和E-UTRAN实现中，UE 105可以提供其定位能力作为在RRC连接建立完成消息中信号通知的MDT能力信息的一部分。 In UTRAN and E-UTRAN implementations, UE 105 may provide its positioning capabilities as part of the RRC connection setup complete MDT capability information message is signaled. 因此，如以下更详细描述的，在示例实现中，MDT的测量配置应当包括辅助数据和/ 或如果无线条件变为劣于配置阈值则UE 105应当请求辅助数据传送的指示。  Thus, as described in more detail below, in the exemplary implementation, MDT measurement configuration should include auxiliary data, and / or if the radio condition becomes worse than the configured threshold the UE 105 indicating the request for assistance data should be transmitted. 此外，网络应当向UE 105传送辅助数据以及相关联的有效性信息，如持续时间和区域。 Furthermore, the network shall transmit to the UE 105 and the auxiliary data associated with the validity information, such as duration and area. 此外，UE 105应当指示其定位能力，作为在RRC连接建立完成消息中信号通知的MDT能力信息的一部分。 Furthermore, UE 105 shall indicate its positioning capabilities, as part of the RRC connection setup complete MDT capability information message is signaled. 附加地或备选地，网络可以配置当UE 105遇到的问题解决时（如UE105在覆盖外之后回到覆盖，或当UE 105停止经历BCCH失败时）要执行的定位测量。  Additionally or alternatively, the network may configure the UE 105 when the problem encountered when solutions (e.g. UE105 after covering the outer back cover, or when the UE 105 fails to stop experienced BCCH) to perform positioning measurements. 相反，先前示例尝试当UE移至覆盖外时获取位置信息。 In contrast, attempts to obtain location information of the previous example, when the UE moves out of coverage. 然而，如果无线条件迅速恶化，可能没有足够时间来配置定位测量。 However, if the radio conditions deteriorate quickly, it may not have enough time to configure the positioning measurements. 因此，该备选方案尝试当问题解决时获取位置信息。 Therefore, this option attempts to obtain location information when the problem is solved. 在连接模式下，网络可以利用RRM测量配置，在RRC连接重建过程成功完成之后就配置定位测量。 In the connected mode, the network can use the RRM measurement configuration, after the connection reestablishment procedure is completed successfully on positioning measurements arranged in RRC. 在UTRAN实现中，SRNC发送测量控制消息以执行测量配置，而在E-UTRAN实现中，eNB可以经由MME向E-SMLC发送定位测量请求。 In the UTRAN implementation, the SRNC sends a measurement control message to perform the measurement configuration, and the E-UTRAN implementations, the eNB may send a request to a positioning measurement E-SMLC via the MME. 在不成功无线链路失败恢复的情况下，网络可以在RRC重建拒绝消息中向UE 105 指示UE 105是否应当发起M0-LR过程，使得UE 105在建立RRC连接之后发起M0-LR过程或RRC 连接建立，指示连接建立的目的是MDT定位(使得网络可以在连接模式下配置定位测量）。 In the case of radio link failure recovery is unsuccessful, the network may reestablishment reject message if the UE 105 should be initiated M0-LR to the UE 105 during RRC indication, such that UE 105 initiates M0-LR procedure after the RRC connection is established or an RRC connection establishment, indicating the purpose of the connection establishment is MDT positioning (positioning measurements may be configured so that the network in connected mode). 在空闲模式下，在系统信息中广播的MDT测量配置信息可以指示：如果UE 105经历的问题解决，或者无线条件变为劣于一个或多个阈值，则UE应当发起RRC连接建立或M0-LR过程。 In the idle mode, system information broadcast in the MDT measurement configuration information may indicate: if the UE 105 experiences a problem to solve, or the radio condition becomes worse than the one or more thresholds, the UE shall initiate an RRC connection establishment or M0-LR process. 此外，MDT的测量配置可以包括定位请求准则和一个或多个定位请求模式(也称为位置请求模式）。  Further, MDT measurement configuration may include a positioning request criteria and one or more positioning request mode (also referred to as location request mode). 例如，定位请求准则可以包括事件标识(或描述符)和触发条件。 For example, an event location request criteria may include identification (or descriptors) and triggers. 示例事件标识包括"返回覆盖"、"服务小区信号强度或质量变为劣于阈值"等等;示例触发条件包括： 位置请求概率因子、定位能力、报告范围（例如所需停用持续时间范围）、接入类别等等。 Examples of the event identifier includes "back cover", "serving cell signal strength or quality becomes worse than the threshold value" and the like; examples of trigger conditions comprising: a position request probability factor, positioning capabilities, reporting range (e.g., required outage duration range) access category, and so on. 在至少一些示例实现中，网络包括概率因子作为触发条件，以减少位置请求的数目。 In at least some example implementations, the network comprises a probability factor as a trigger, in order to reduce the number of location requests. 在这种示例中，在检测到与所配置的事件标识相对应的事件时，UE 105抽取随机数。 In this example, upon detection of the event identification configuration corresponding to the event, UE 105 extracts a random number. 如果随机数小于概率因子(或备选地大于概率因子），则不允许UE发起位置请求过程。 If the random number is less than the probability factor (or alternatively, greater than the probability factor), the UE is not allowed to initiate a location request procedure. 在至少一些示例实现中，网络还指示以下至少一项作为限制位置请求数目的其他方式:所需定位能力、所需接入类别或所需停用持续时间范围。 In at least some example implementations, at least one of the network as a further indication otherwise limit the number of requests position: positioning capability required, desired or required to access category outage duration range. 例如，如果UE的定位能力不匹配所指示的定位能力，或者UE 的接入类别不匹配所指示的接入类别，则不允许UE 105发起用于MDT的位置过程。 For example, if the positioning capability of the UE does not match the indicated positioning capability, or the UE does not match the access category indicated access class is not allowed for the UE 105 to initiate a location process in the MDT. 此外，如果所检测的事件是覆盖外，并且覆盖外的持续时间不在所配置的停用持续时间范围之内， 则不允许UE 105发起用于MDT的位置请求。 Further, if the detected event is an outer cover, and an outer cover duration is not deactivated within a configured time duration, the UE 105 is not allowed to initiate a location request for the MDT. 通过使用所需停用持续时间范围，可以防止与短期(例如短于所需持续时间范围）或长期(例如长于所需持续时间范围）的覆盖问题(例如处于电梯中或者在地下室看电视)相关联的位置请求，以降低网络负载。 By using the required outage duration range, can prevent associated with short-term (for example, shorter than the duration required for range) or long-term (eg, longer than the duration required for range) coverage problems (eg, in an elevator or watch TV in the basement) associated location request, in order to reduce the network load. 示例定位请求模式包括但不限于:M〇-LR(辅助数据请求）、M〇-LR(定位测量）、RRC 连接建立等等。  The exemplary positioning request modes include but are not limited to: M〇-LR (assistance data request), M〇-LR (positioning measurement), and so the RRC connection establishment. 如果请求RRC连接，UE 105在RRC连接建立过程中指示MDT定位请求，例如作为RRC连接请求消息中的建立原因，或者作为RRC连接请求建立完成消息中的附加信息单元。 If the RRC connection request, UE 105 an RRC connection establishment procedure indicated MDT location request, such as an RRC connection establishment cause in the request message, or an RRC connection establishment request completion additional information element in the message. 作为响应，网络可以调用RRM定位测量和/或从UE 105收集记录信息。 In response, the network may call RRM positioning measurements and / or collect information from UE 105 records. 因此，如以下更详细描述的，在示例实现中，3GPP通信网络100将UE 105配置为在返回覆盖区时发起RRC连接或位置请求。  Thus, as described in more detail below, in the exemplary implementation, 3GPP communication network 100 configured to initiate the UE 105 an RRC connection or when a location request return coverage area. 此外，MDT的测量配置可以包括位置请求准则和定位请求模式。 Further, MDT measurement configuration request criteria may include location requests and positioning mode. 位置请求准则可以包括事件标识(或描述符)和触发条件。 Event location request criteria may include identification (or descriptors) and triggers. 触发条件包括例如： 位置请求概率因子、所需定位能力、所需停用持续时间范围、上限和/或下限等等，以减少位置请求的数目。 Trigger conditions include, for example: a location request probability factor, the desired positioning capabilities, required outage duration range, the upper and / or lower the like, in order to reduce the number of location requests. 定位请求模式包括例如:针对辅助数据的M0-LR、针对定位测量的M〇-LR、RRC 连接请求等等。 Mode positioning request including, for example: M0-LR for assistance data for positioning measurement M〇-LR, RRC connection request and the like. 此外，在至少一些示例实现中，如果MDT的测量配置请求UE 105建立RRC连接以用于定位，则UE指示MDT定位作为RRC连接请求消息中的建立原因，或者作为RRC连接请求建立完成消息中的附加信息单元。 Further, in at least some example implementations, MDT measurement configuration request if the UE 105 to establish an RRC connection for positioning, the positioning as MDT UE indicates an establishment cause the RRC connection request message or an RRC connection setup complete message request the additional information unit. 在一些场景中，在返回覆盖区之后就定位可能不能产生精确的位置信息，因为可见卫星的数目可能较少，或者用于定时差测量的相邻小区的数目可能有限。  In some scenarios, after returning to the coverage area may not produce accurate positioning position information, since the number of visible satellites may be less, or the number of neighboring cells for the measurement of the timing difference may be limited. 因此，在示例实现中，如果可用，执行多个定位过程。 Thus, in an example implementation, if available, a plurality of positioning procedure performed. 例如，在执行全球定位系统(GPS)定位时，UE 105还可以选择多个合适相邻小区并测量导频信号强度和质量，以进行可能的E-CID计算。 For example, when performing a Global Positioning System (GPS) positioning, UE 105 can select an appropriate neighbor cell and a plurality of pilot signal strength measurements and quality for possible E-CID calculated. 例如，如果用于E-CID定位的小区列表可用于UE 105,则UE 105测量这些小区。 For example, if a cell for E-CID list may be used for positioning UE 105, the UE 105 to measure these cells. 同时，如果UE 105处于连接模式，则在网络侧，实现当前小区110的服务基站可以测量到达角(A0A)和接收信号功率。 Meanwhile, if the UE 105 is in connected mode, the network side to realize the current serving cell base station 110 may measure the angle of arrival (A0A) and received signal power. 由于可能需要一些时间来完成定位测量，在示例实现中，定位被配置为周期性测量，此外，如果可用，则包括速度测量。  Since it may take some time to complete positioning measurements, in the exemplary implementation, is configured to periodically measure the positioning, in addition, if available, including the velocity measurement. 在这种示例中，UE 105或网络可以使用周期性定位和速度测量，以使用例如这些测量的多个实例和从最初定位起的时间来推断UE 105返回覆盖的位置。 In such an example, UE 105 or the network may use a periodic position and velocity measurements, for example using multiple instances of these measurements and the UE 105 from the initial position to return the positioning cover from time to infer. 总而言之，3GPP通信系统100支持以下一些或全部配置，以确定MDT测量的定位(位置)信息：（1)定位测量的去激活条件，如持续时间和阈值；（2)辅助数据（具有其有效性信息，如持续时间和区域）；（3)位置请求准则，指示:如果满足准则，则UE 105应当发起位置请求过程，其中示例位置请求准则包括:一个或多个事件标识、位置请求概率因子、定位能力、 所需报告范围（例如所需停用持续时间范围）、接入类别等等；以及(4)定位请求模式，指定当满足位置请求准则时，UE 105应当调用何种位置请求过程，如M〇-LR(辅助数据请求）、M0-LR(定位测量)和RRC连接建立等等。  In summary, 3GPP communication system 100 supports the following some or all of the configuration to determine the location of the MDT measurement (location) information: a deactivated condition (1) positioning measurements, such as the duration and the threshold value; (2) an auxiliary data (with its validity information, such as duration and area); (3) the location request criteria indicate: if the criteria are met, the UE 105 initiates a location request procedure should, wherein the location request exemplary criterion comprises: identifying one or more events, location request probability factor, positioning capabilities, reporting range desired (e.g., required outage duration range), the access category and the like; and when (4) positioning request mode, when a designated location request satisfies criteria, UE 105 positions which should be called requesting process, as M〇-LR (assistance data request), M0-LR (positioning measurement) and RRC connection establishment and the like. 尽管这里公开的示例方法和设备是在图1的示例3GPP通信系统100的上下文中描述的，但是这些示例方法和设备可以容易适用于采用可以执行MDT测量的MDT框架的任何通信系统。  Example methods and apparatus although the disclosure is described in the context of the example of FIG. 1 3GPP communication system 100, these example methods and apparatus may be readily adapted to the use of any communication system may perform MDT frame MDT measurement. [00611图2示意了用于实现图1的3GPP通信系统100中的MDT框架的示例用户平面(U平面） 架构200。 [00611 Figure 2 illustrates an example of a user plane (U-plane) for implementing the 3GPP communication system of FIG. 1 MDT frame 100 in the architecture 200. 图2的U平面架构200还示意了引入运营商的核心网来实现MDT框架。 FIG 2 is U-Plane architecture 200 also illustrates the introduction of the operator's core network to implement MDT frame. U平面架构200 对应于E-UTRAN实现，并包括UE 105和实现当前小区110的eNB 205JDT框架中涉及的运营商的核心网的部分包括：网络管理器210以及实现例如分组数据网（PDN)网关和服务网关以将eNB 210通信耦合至运营商的因特网协议(IP)网络220的网关215。 U-Plane architecture 200 corresponding to the E-UTRAN implemented, and comprising a part of the core network of the operator eNB 205JDT frame cell 110 involved in the current UE 105 and implement comprising: a network manager 210 and implemented e.g. packet data network (PDN) gateway and the service gateway to communicate eNB 210 coupled to the operator's Internet protocol (IP) gateway 215 of network 220. 在U平面架构200中，eNB 205和UE 105建立常规用户平面连接（表示为有向箭头225和230)。  In the U-plane architecture 200, eNB 205 and a UE 105 establish a conventional user plane connection (represented as a directed arrows 225 and 230). 网络管理器210使用下行链路用户平面连接225来配置UE 105中的MDT功能。 Network manager 210 using the downlink user plane connection 225 to configure the UE 105 MDT functionality. 可以使用一个或多个短消息服务(SMS)消息、一个或多个电子邮件、一个或多个BlackBerry® 个人标识号码(PIN)消息等等，经由例如动态空中配置来执行这种配置。 You can use one or more short message service (SMS) messages, one or more e-mail, one or more BlackBerry® personal identification number (PIN) messages, etc., such as dynamic-air configuration is performed via this configuration. UE 105使用上行链路用户平面连接230，将MDT测量记录传送至网络管理器210，这对于eNB205和核心网的其余部分而言是透明的。 UE 105 using an uplink user plane connection 230, MDT measurement record to the network manager 210, which is transparent to the rest of the core network eNB205. 在示例实现中，UE 105可以在一段时间（例如几分钟、一个或多个小时、 一天等等）内记录测量。 In an example implementation, UE 105 may be a period of time (e.g., several minutes, one or more hours, one day, etc.) within the recording measured. 在这种示例中，UE 105向网络管理器210传送的记录文件的大小可以在每天几兆字节的数量级。 In this example, the size of the UE 105 to the network manager 210 records the file transfer may be on the order of several megabytes per day. 图3示意了用于实现图1的3GPP通信系统100中的MDT架构的示例控制平面(C平面） 架构300。  FIG. 3 illustrates an example of MDT 100 3GPP architecture in a communication system used to implement the control plane (C-plane) 300 architecture. 相对于图2的U平面架构200,减少了核心网的引入以使用C平面架构300来实现MDTX平面架构300对应于E-UTRAN实现，并包括UE105、实现当前小区110的eNB 305、以及网络管理器310。 With respect to the U-plane architecture 200 of Figure 2, to reduce the introduction of a core network to use the C-plane architecture 300 to achieve MDTX plane architecture 300 corresponding to the E-UTRAN implemented, and comprising a UE 105, to achieve the current eNB cell 110, 305, and network management 310. 在C平面架构300中，eNB 305使用例如一个或多个RRC信令消息（由下行链路有向箭头315表示）将UE 105配置为进行MDT操作。 In the C-plane architecture 300, eNB 305, for example, using one or more RRC signaling message (indicating a downlink direction of arrow 315) The UE 105 is configured for operation MDT. eNB 305经由例如由上行链路有向箭头320表示的测量报告、RRC信令等等，从UE 105收集MDT测量。 e.g. eNB 305 via the uplink measurement reports have indicated an arrow 320, RRC signaling like, MDT measurement from the collected UE 105. 然后。 then. eNB 305将收集的测量与其他可用结果组合，并将组合的测量(例如可能在过滤之后)转发给网络管理器310,这种转发由有向箭头325表示。 The collected measurement eNB 305 in combination with other available measurement results, and the combined (e.g., possibly after filtering) forwarded to the network manager 310, which is represented by the directional arrow forwarded 325. 在从一个或多个UE(例如包括UE105)收集并处理测量之后，将所获得和处理的记录从网络管理器310传送至运营和维护(0&M)系统(未示出）。 Recorded after collection from the one or more UE (including e.g. UE 105) and processing the measurement, the obtained processed and transmitted from the network manager 310 to the operation and maintenance (0 & M) system (not shown). 在图5中，eNB 305的示意实现包括MD頂S置处理器505,以准备和向UE 105发送MDT 配置信息，包括一个或多个激活、去激活、报告和/或以下更详细描述的其他条件。  In FIG. 5, the eNB 305 implementation includes a schematic top MD S-processor 505 to prepare and send MDT configuration information to UE 105, comprising one or more activation, deactivation, reporting, and / or more detail below other conditions are described. eNB 305 还包括MDT报告处理器510,以经由例如测量报告、RRC信令等等，从UE 105接收MDT测量报告/记录。 eNB 305 further includes MDT reporting processor 510, for example via a measurement report, the RRC signaling like, MDT measurement report receiving / recording from the UE 105. eNB 305还包括MDT记录和报告处理器515,以将从一个或多个UE(包括UE 105)接收的MDT测量/记录转发至MDT管理器310以进行进一步处理。 eNB 305 further includes MDT logging and reporting processor 515 to from one or more UE (including UE 105) MDT measurement of the reception / recording MDT forwarded to the manager 310 for further processing. MD頂S置处理器505、MDT报告处理器510和MDT记录和报告处理器515的示例实现和操作在后续图中示意并在以下予以更详细的描述。 S MD set top processor 505, the example MDT reporting processor 510 and processor 515 MDT logging and reporting operations and to achieve the following be illustrated and described in more detail in subsequent figures. 尽管已经在图4中示意了实现图1-3的UE 105的示例方式，并且已经在图5中示意了实现图3的eNB 305的示例方式，但是图4-5中示意的一个或多个单元、过程和/或设备可以组合、划分、重新配置、省略、消除和/或以其他方式实现。  Although schematically in FIG. 4 that the UE 105 is implemented exemplary embodiment of FIGS. 1-3, and illustrates an example embodiment has been implemented in FIG. 3 eNB 305 in FIG. 5, but a 4-5 illustrated in FIG. or more units, processes and / or devices may be combined, divided, re-arranged, omitted, eliminated and / or implemented in other ways. 此外，示例测量配置处理器405、 示例测量执行处理器410、示例测量记录处理器415和示例测量报告处理器420和/或更一般地图4的示例UE 105可以由硬件、软件、固件和/或硬件、软件和/或固件的任何组合实现。 Further, examples of the measurement configuration processor 405, the example measurement performance processor 410, the example processor 415 and records the measurement sample measurement reporting processor 420 and / or, more generally exemplary UE 105 may map 4 by hardware, software, firmware, and / or any combination of hardware, software and / or firmware. 类似地，示例MD頂S置处理器505、示例MDT报告处理器510和示例MDT记录和报告处理器515和/ 或更一般地，图5的示例eNB 305可以由硬件、软件、固件和/或硬件、软件和/或固件的任何组合实现。 Similarly, top MD exemplary S-processor 505, the example MDT reporting processor 510 and example MDT logging and reporting processor 515 and / or, more generally, the example of FIG. 5 eNB 305 may be implemented by hardware, software, firmware, and / or any combination of hardware, software and / or firmware. 因此，例如，示例UE 105、示例测量配置处理器405、示例测量执行处理器410、示例测量记录处理器415、示例测量报告处理器420、示例eNB 305、示例MDT配置处理器505、示例MDT报告处理器510和/或不例MDT记录和报告处理器515中的任一个可以由一个或多个电路、可编程处理器、专用集成电路(ASIC)、可编程逻辑器件(PLD)和/或现场可编程逻辑器件(FPLD)等等来实现。 Thus, for example, the example UE 105, measurement configuration example processor 405, the example measurement performance processor 410, the example measurement recording processor 415, the example measurement report processor 420, the example eNB 305, MDT exemplary configuration processor 505, the example report MDT processor 510 and / or 515 in any embodiment MDT recording and reporting processor by one or a plurality of circuits, programmable processors, application specific integrated circuit (ASIC), a programmable logic device (PLD) and / or field programmable logic devices (an FPLD) and the like to achieve. 在至少一些示例实现中，示例UE 105、示例测量配置处理器405、示例测量执行处理器410、示例测量记录处理器415、示例测量报告处理器420、示例eNB 305、示例MDT配置处理器505、示例MDT报告处理器510和/或示例MDT记录和报告处理器515中的至少一个在此明确定义为包括存储这种软件和/或固件的有形介质，如存储器、数字通用光盘(DVD)、紧致光盘(CD)等等。 In at least some example implementations, the example UE 105, measurement configuration example processor 405, the example measurement performance processor 410, the example measurement recording processor 415, the example measurement report processor 420, the example eNB 305, MDT exemplary configuration processor 505, example MDT reporting processor 510, and / or MDT logging and reporting processor 515 are hereby expressly defined to include storing such software and / or firmware, tangible medium, such as a memory, digital versatile disk (DVD), compact cause disc (CD) and so on. 再进一步，作为对图4-5分别示意的单元、过程和/或设备的补充或替代，图4的示例UE 105和/或图5的示例eNB 305可以包括一个或多个单元、过程和/或设备，和/或可以包括所示单元、过程和设备中的任一或全部中的多于一个。 Still further, as the unit of Figures 4-5 schematically, complementary or alternative processes and / or devices, example of Figure 4 an example UE 105 and / or eNB 305 in FIG. 5 may include one or more elements, processes and / or apparatus, and / or may include any or all of the cells, the processes and devices in more than one. 图6、7、8A-B、10-15和17-21中示出了表示可以执行以实现示例3GPP通信系统100、 示例U平面架构200、示例C平面架构300、UE 105、示例测量配置处理器405、示例测量执行处理器410、示例测量记录处理器415、示例测量报告处理器420、示例eNB 305、示例MDT配置处理器505、示例MDT报告处理器510和/或示例MDT记录和报告处理器515的示例过程的流程图。  FIG 6,7,8A-B, 10-15 and 17-21 shows a representation may be executed to implement the example 3GPP communication system 100, exemplary architecture 200 U plane, C plane exemplary architecture 300, UE 105, Example measurement configuration processor 405, the example measurement performance processor 410, the example measurement recording processor 415, the example measurement report processor 420, the example eNB 305, MDT exemplary configuration processor 505, the example MDT reporting processor 510, and / or recording MDT a flowchart of an example process 515 and reporting processor. 在这些示例中，每个流程图表示的过程可以由一个或多个程序实现，所述程序包括用于由以下执行的机器可读指令：（a)处理器，如以下关于图22讨论的处理系统2200中示出的处理器2212; (b)控制器;和/或(c)任何其他合适设备。 In these examples, each process represented by the flowchart may be implemented by one or more programs, the program comprising a machine-readable instructions for execution by the following: (a) a processor, such as the following discussion of the processing of FIG. 22 the processor system 2200 illustrated in 2212; (b) a controller; and / or (c) any other suitable device. 所述一个或多个程序可以实现为有形介质上存储的软件，所述有形介质例如闪存、⑶-R0M、软盘、硬盘、DVD、或与处理器2212相关联的存储器，但是整个程序和/或其部分可以备选地由不同于处理器2212的设备来执行， 和/或实现为固件或专用硬件(例如由六51(：、？0)、? ?0)、离散逻辑等等实现）。 The one or more programs may be implemented as software stored on a tangible medium, the tangible medium such as a flash memory ⑶-R0M, a flexible disk, hard disk, DVD, or the processor 2212 associated with, but the entire program and / or portions thereof, may alternatively be performed by a device different from the processor 2212, and / or implemented in firmware or dedicated hardware (e.g. 51 consists of six (:, 0), ?? 0?) to achieve, discrete logic, etc.). 例如，示例3GPP通信系统100、示例U平面架构200、示例C平面架构300、UE 105、示例测量配置处理器405、示例测量执行处理器410、示例测量记录处理器415、示例测量报告处理器420、示例eNB 305、示例MD頂S置处理器505、示例MDT报告处理器510和/或示例MDT记录和报告处理器515中的任一或全部可以由软件、硬件和/或固件的任何组合来实现。  For example, exemplary 3GPP communication system 100, exemplary architecture 200 U plane, C plane exemplary architecture 300, UE 105, measurement configuration example processor 405, the example measurement performance processor 410, the example measurement recording processor 415, the example measurement report the processor 420, the example eNB 305, the top MD exemplary S-processor 505, processor 510 reports any MDT example, and / or MDT logging and reporting processor 515 may be one or all of the software, hardware and / or firmware any combination thereof. 此外， 图6、7、8A-B、10-15和17-21所示的过程中的至少一些可以手动实现。 Further, FIG. 6,7,8A-B, at least some of the process shown may be implemented manually 10-15 and 17-21. 此外，尽管参照图6、7、 8A-B、10-15和17-21所示的流程图描述示例过程，但是备选地可以使用许多其他技术来实现这里描述的示例方法和设备。 Further, although reference to FIGS. 6,7, 8A-B, 10-15 and 17-21 in the flowchart shown in the example processes described, but alternatively may be used in many other techniques to implement the example methods and apparatus described herein. 例如，参照图6、7、8A-B、10-15和17-21所示的流程图，框的执行顺序可以改变，和/或所描述的一些框可以改变、消除、组合和/或再分为多个框。 For example, referring to FIG. 6,7,8A-B, 10-15, and the order of execution flowchart shown in blocks 17-21 may be changed, and / or some of the blocks described may be changed, eliminated, combined and / or re- divided into several boxes. 在以下描述的示例过程600、800、1000和1100中的一些或全部中，当有效MDT测量记录信息可用（例如当UE 105将要和/或已经经历覆盖或来回往复问题）时，如果满足任何所配置的报告准则（如果存在的话），UE 105可以请求RRC连接，其中RRC连接请求消息具有针对"MDT报告"的特定建立原因，以报告所记录的MDT测量数据。  In the exemplary process described below 600,800,1000 and 1100 of some or all, when the recording information is available effectively MDT measurement (e.g., when to and UE 105 / coverage or has experienced problems or back and forth), if reporting guidelines to meet any configured (if present), UE 105 can request an RRC connection, wherein the RRC connection request message has established for the "MDT report" specific reason, the MDT measurement report to the recorded data. 备选地，UE 105可以将指示"MDT报告"的信息单元包括在RRC连接建立完成消息中。 Alternatively, UE 105 may indicate "MDT report" information element includes a connection setup complete message in RRC. 图6示意了可以执行以实现图1-4的UE 105中的MDT处理的示例一般过程600。  FIG. 6 illustrates a general procedure of example may be performed to achieve the processing MDT UE 105 in FIGS. 1-4 600. 过程600可以作为后台过程、周期性地、基于特定事件的出现等等或其任何组合来执行。 Process 600 may be used as a background process, periodically, based on a specific event occurs, etc., or any combination thereof. 参照图1 -4，过程600始于框604，其中UE 105中包括的测量配置处理器405经由例如RRC信令、广播系统信息等等来获得MDT测量配置信息。 Referring to FIGS. 1-4, process 600 begins at block 604, where the UE 105 included in the measurement configuration information processor 405 configured e.g. RRC signaling, and the like to obtain the broadcast system information via the MDT measurement. 以上关于图1描述了在框604获得的MDT配置信息的示例，以下还将更详细的予以描述。 Above with respect to FIG. 1 depicts an example of the configuration information in the MDT obtained in block 604, the following will be described in more detail. 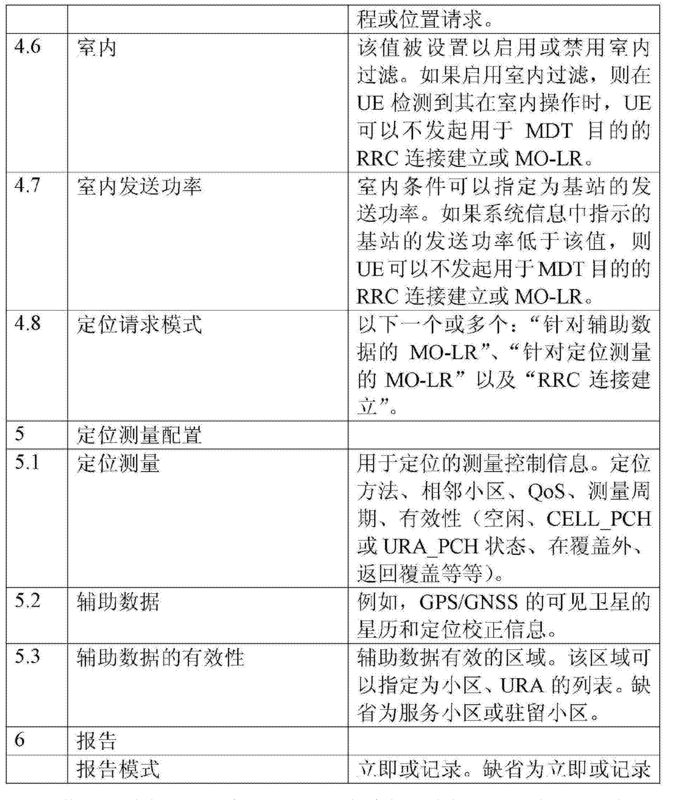 示例MDT配置信息也在以下描述的表1中列出。 Table 1 Example MDT configuration information described below are also listed. 接下来，在框608，UE 105中包括的测量执行处理器410评估在框604中获得的MDT 配置信息中指定的一个或多个MDT测量激活准则。  Next, block 608, configuration information 410 MDT evaluate measurement performance processor UE 105 included in block 604 obtained in the one or more specified criteria MDT measurement activation. 在示例实现中，如果满足一个或多个激活准则(框612)，或者在另一示例实现中，如果满足所有激活准则(框612)，则在框616,测量执行处理器410执行所配置的MDT测量，并且UE 105中包括的测量记录处理器415记录测量结果（或者例如，如果配置了中间报告，则UE 105中包括的测量报告处理器420报告测量结果）。 In an exemplary implementation, if they meet one or more activation criteria (block 612), or, in another example implementation, if all activation criteria (block 612) is satisfied, at block 616, the processor 410 executes measurement execution configured MDT measurement, and the UE 105 includes a measurement recording processor 415 records the measurement result (or, for example, if the intermediate configuration report, the measurement report 105 includes a processor 420 reports the measurement result UE). 在框620，UE 105中包括的测量报告处理器420评估在框604中获得的MDT配置信息中指定的一个或多个MDT报告准则。 At block 620, MDT measurement reporting processor 420 included in the evaluation UE 105 obtained in block 604 to configure one or more information MDT reporting criteria specified. 在示例实现中，如果满足一个或多个报告准则(框620)，或者在另一示例实现中，如果满足所有报告准则(框620)，则在框624,测量报告处理器420向例如实现当前小区110的eNB 305报告MDT测量记录。 In an example implementation, if the report satisfies one or more criteria (block 620), or, in another example implementation, if all reporting criteria (block 620) is satisfied, at block 624, the current measurement reporting processor 420 to implement e.g. cell eNB 305 110 MDT measurement report record. 在框628,测量执行处理器410评估在框604获得的MDT配置信息中指定的一个或多个MDT位置请求准则。  In block 628, the measurement configuration information processor 410 performs the MDT evaluation obtained at block 604 specified in one or more positions MDT request criteria. 在示例实现中，如果满足一个或多个请求准则(框628)，或者在另一示例实现中，如果满足所有请求准则(框628)，则在框632,如在框604所获得的MDT配置信息所指定的，测量执行处理器410执行定位测量和/或从网络请求位置信息。 In an example implementation, if the request satisfies one or more criteria (block 628), or, in another example implementation, if all request criteria (block 628) is satisfied, at block 632, as in block 604 MDT configuration obtained information specified measurement performance processor 410 executes the positioning measurements and / or request information from a network location. 在框636,测量执行处理器410评估在框604获得的MD頂S置信息中指定的一个或多个MDT测量去激活准则。 At block 636, performing one or more measurements MDT measurement evaluation processor 410 in block 604 the top S MD obtained location information specified deactivation criteria. 在示例实现中，如果不满足任何去激活准则(框636)，或者在另一示例实现中，如果不是所有去激活准则都得到满足(框636)，则MDT测量处理继续，在所示示例中，过程600返回框604以允许UE 105获得新的/更新的MD頂S置信息（如果存在）。 In an exemplary implementation, if any deactivation criteria is not satisfied (block 636), or in another exemplary implementation, if not all deactivation criteria are met (block 636), then processing continues MDT measurement, in the example shown , process 600 returns to block 604 to allow UE 105 to obtain a new / updated top MD S configuration information (if present). 否则，去激活MDT测量，以及在至少一些示例实现中去激活记录和报告，过程600结束，直到其下一调用。 Otherwise, to activate MDT measurements, as well as at least some example implementations to activate logging and reporting, process 600 ends, until the next call. 在至少一些示例实现中，可以在框636检查用于执行MDT测量和用于执行MDT位置请求的单独的去激活准则。  In at least some example implementations, it is used to perform measurements and for performing the MDT separate deactivation criteria MDT location request checks at block 636. 因此，可以经由框636处的处理，独立地或联合地去激活MDT测量、MDT位置请求或两者。 Accordingly, at process block 636 via, independently or jointly deactivated MDT measurement, MDT location request, or both. 在以下图中示意并在以下更详细描述可以用于实现一般过程600中的一些或全部处理的过程示例。  In the following illustrative figures and described in more detail below may be used to implement the process 600 of some or all of the processing example of the general process. 图7示意了可以执行以实现图2-3和5的eNB 305中的MDT处理的示例一般过程700。  FIG. 7 illustrates a process may be executed to implement MDT eNB 305 in FIGS. 2-3 and 5, the general procedure of Example 700. 过程700可以作为后台过程、周期性地、基于特定事件的出现等等或其任何组合来执行。 Process 700 may be used as a background process, periodically performed based on the occurrence of a particular event, etc., or any combination thereof. 参照图2-3和5,过程700始于框704,其中eNB 505中包括的MD頂S置处理器505准备并经由RRC 信令、广播系统信息等等向UE(例如UE 105)发送MDT配置信息。 Referring to FIGS. 2-3 and 5, process 700 begins at block 704, MD top S-processor 505 included in the preparation wherein the eNB 505 and transmits the MDT configuration via RRC signaling, etc. to the broadcast system information UE (e.g. UE 105) information. 以上关于图1描述了在框604 获得的MDT配置信息的示例，以下还将更详细的予以描述。 Above with respect to FIG. 1 depicts an example of the configuration information in the MDT obtained in block 604, the following will be described in more detail. 示例MDT配置信息也在以下描述的表1中列出。 Table 1 Example MDT configuration information described below are also listed. 在框708，eNB 305中包括的MDT报告处理器510经由测量报告、RRC信令等等，从eNB 305服务的一个或多个UE(例如UE 105)接收MDT测量记录。  included in the block 708, eNB 305 in processor 510 via the MDT reporting a measurement report, the RRC signaling like, MDT measurement records received from the one or more services UE eNB 305 (e.g., UE 105). 然后，在框712，eNB 305中包括的MDT记录和报告处理器515将从一个或多个UE(例如包括UE 105)接收到的MDT测量/记录转发至例如网络管理器310以进行进一步处理。 Then, at block includes 712, eNB 305 in the MDT logging and reporting processor 515 from one or more UE (including e.g. UE 105) receives the MDT measurement / record forwarded to the network manager 310, for example, for further processing. 在所示示例中，在某个随后的时间，eNB 305准备要发送的新的/更新的MDT配置信息，从而过程700返回框704。 In the illustrated example, at some subsequent time, eNB 305 is ready to send a new MDT configuration information / updated, so the process 700 returns to block 704. 在以下图中示意并在以下更详细描述可以用于实现一般过程700中的一些或全部处理的过程示例。  In the following illustrative figures and described in more detail below may be used to implement the process 700 of some or all of the processing example of the general process. 图8A-B示意了UE 105可以执行以确定MDT小区选择/重选测量(也称为驻留测量） 的示例过程800。  FIGS. 8A-B illustrates a UE 105 may be performed to determine the MDT cell selection / reselection measurement (also referred to as a resident measurement) of an example process 800. 过程800可以用于实现图6的一般过程600的至少部分。 Process 800 may be used to implement the process of Figure 6 is generally at least a portion 600. 如果网络启用MDT小区选择/重选测量和记录，则当处于空闲模式时，周期性地，或当执行小区选择/重选时，UE 105根据过程800配置为执行PDP测量。 If the network is enabled MDT cell selection / reselection measurement and recording, when it is in idle mode, periodically, or when the cell selection / reselection, UE 105 to perform the process 800 in accordance with the measurement configuration PDP. 此外，UE 105被配置为测量和记录/向网络报告以下信息中的任一、一些或全部：（1)驻留状态(例如受限或正常）；⑵移动性状态(例如正常/中等/高）；（3)驻留于服务小区和特定(例如指定)数目的最佳相邻小区的优先级；（3)特定(例如指定)数目的最强小区的任何禁止和预留状态；（5)特定(例如指定)数目的最强不允许封闭订户组(CSG)小区等等。 Furthermore, UE 105 is configured to measure and record / report to the network according to any one of the following information, some or all of: (1) dwell state (e.g., normal or restricted); ⑵ mobility state (e.g., normal / medium / high ); (3) residing in the serving cell and the particular (e.g., designated) the priority number of the best neighboring cell; (3) the specific (e.g., reservation status and specify any prohibited) number of the strongest cell; (5 ) specific (e.g. specified) number of the strongest allowed closed subscriber group (CSG) cell and the like. 此外，网络配置UE 105要执行小区选择/重选测量和记录的持续时间和特定条件，以例如降低记录信息的量溢出UE的存储器容量的概率。 In addition, the probability for a cell selection / reselection duration of certain conditions and measured and recorded, for example, reduce the amount of overflow of the memory capacity for recording information of the UE 105 network configuration UE. 转到图8A，过程800始于框802,其中UE 105获得包括以下一个或多个的MDT测量配置信息:覆盖外激活和去激活阈值、返回覆盖激活和去激活阈值、测量和记录的指定持续时间（例如要用作去激活条件）、指定有效覆盖外持续时间（例如要用作记录/报告准则）、用于测量的最佳小区的指定数目等等。  to 8A, the process 800 begins at block 802, wherein UE 105 comprises obtaining one or more MDT measurement configuration information: coverage activation and deactivation thresholds, back to coverage activation and deactivation thresholds measured and recorded specified duration (e.g., to be used as a deactivated condition), specifying a valid duration of coverage (e.g. to be used as a recording / reporting standards), the number of designated measurement for the best cell and the like. 例如，覆盖外激活阈值用于在信号强度或质量降至低于激活阈值时激活MDT测量;而覆盖外去激活阈值用于去激活所激活的MDT测量。 For example, coverage activation threshold for activating the activated MDT measurement falls below a threshold signal strength or quality; and covering an outer deactivation threshold for deactivating the activated MDT measurement. 例如，当信号强度或质量降至低于第一覆盖外去激活阈值(例如可以与针对UTRAN的3GPP TS 25.304和针对E-UTRAN的3GPPTS 36.304中定义的小区选择5准则相同或相似)或超过第二覆盖外去激活阈值时，去激活MDT测量。 For example, when the signal strength or quality falls below a first outer cover deactivation threshold (for example, with 3GPP TS 25.304 for the UTRAN cell and selection for 3GPPTS 36.304 defined in E-UTRAN 5 of the same or similar criteria) or exceeds the Second outer cover deactivation threshold, deactivating MDT measurement. 图23中示意了这两个示例去激活阈值的这种使用，其中Y轴表示路径损耗(与信号响度或质量成反比），X轴表示时间。  FIG. 23 illustrates two examples of the use of such a deactivation threshold value, the Y-axis represents the path loss (or the loudness of the signal is inversely proportional to mass), X-axis represents time. 在图23的示例中，第一线2305示意了第一示例场景，其中，当路径损耗超过激活阈值2310时(对应于信号强度/质量降至低于激活阈值2310时），激活MDT测量（由第一线2305的粗部2306表示），然后当路径损耗超过第一去激活阈值2315时(对应于信号强度/质量降至低于第一去激活阈值2315时），去激活MDT测量。 In the example of FIG. 23, first line 2305 illustrates a first exemplary scenario, wherein, when the path loss exceeds an activation threshold 2310 (corresponding to signal strength / quality drops below the activation threshold 2310), MDT measurement activation (by a the crude unit 2306 indicates a first line 2305), and then when the path loss exceeds a first activation threshold to 2315 (corresponding to signal strength / quality drops below a first threshold value 2315 when deactivation), MDT measurement deactivated. 第二线2320示意了第二示例场景，其中，当路径损耗超过激活阈值2310时(对应于信号强度/质量降至低于激活阈值2310时），激活MDT测量（由第一线2320的粗部2321表示），然后当路径损耗降至低于第二去激活阈值2325时（对应于信号强度/质量超过第二去激活阈值2325时），去激活MDT测量。 The second line 2320 illustrates a second exemplary scenario, wherein, when the path loss exceeds an activation threshold 2310 (corresponding to signal strength / quality drops below the activation threshold 2310), MDT measurement activation (line 2320 by the first thick portion 2321 shown), and then when the path loss falls below a second threshold value deactivation 2325 (corresponding to signal strength / quality exceeds 2325 second deactivation threshold), MDT measurement deactivated. 参照图23,在与满足第一覆盖外去激活阈值的第一场景相似的情形中，UE 105继续在覆盖外。 Referring to FIG 23, the first outer cover to activate similar that satisfies a first threshold value of scene situations, UE 105 continues to cover the outer. 因此，所执行和记录的MDT测量可能用于标识覆盖空洞问题。 Accordingly, the implementation and recording MDT measurement coverage hole may be used to identify problems. 然而，在与满足第二覆盖外去激活阈值的第二场景相似的情形中，UE 105的无线条件改善，因此，所执行和记录的MDT测量可能相对无用于标识覆盖空洞问题。 However, similar to the outer cover meets a second deactivation threshold in the second case scenario, the UE 105 and the radio conditions improve, therefore, performed and recorded MDT measurement may be relatively free for identifying coverage hole problem. 相反，返回覆盖激活阈值用于在信号强度或质量超过激活阈值时激活MDT测量，而返回覆盖去激活阈值用于去激活所激活的MDT测量。  In contrast, back to coverage activation threshold for activating the activated MDT measurement exceeds a threshold signal strength or quality, and back to coverage deactivation threshold for deactivating the activated MDT measurement. 例如，当信号强度或质量超过第一返回覆盖去激活阈值（例如可以与针对1^1^_勺36? ?13 25.304和针对£-1^1^_勺36? ?丁3 36.304中定义的小区选择S准则相同或相似)或降至低于第二去激活返回覆盖阈值时，去激活MDT测量。 For example, when the signal strength or quality above a first back to coverage deactivation threshold (for example, with a spoon _ 1 ^ 1 ^ 36 ?? 13 and 25.304 for 1 ^ _ £ ^ -1 ?? butoxy spoon 36 3 36.304 defined The cell selection criterion S identical or similar) or falls below a second cover returns deactivation threshold, deactivating MDT measurement. 在满足第一返回覆盖去激活阈值的情形中，UE 105继续保持返回覆盖。 In the case of satisfying a first return covering the deactivation threshold, UE 105 returns to maintain coverage. 因此，所执行和记录的MDT测量可能对标识覆盖空洞问题有用。 Accordingly, the implementation and recording of the measurements may be useful for identification MDT coverage hole problem. 然而，在满足第二返回覆盖去激活阈值的情形中，UE 105的无线条件再次恶化，因此所执行和记录的MDT测量可能相对无用于标识覆盖空洞问题。 However, in the case of satisfying the second return covering the deactivation threshold, the UE 105 radio conditions deteriorated again and therefore MDT measurement and recording may be performed relatively free for identifying coverage hole problem. 在至少一些示例实现中，为了帮助确保稳定的激活和去激活判定，UE 105 采用MDT测量激活与去激活之间的迟滞定时器，以确保在MDT测量激活和去激活之间（以及反之)切换之前已经过去预定或(例如由网络)配置的持续时间。 In at least some example implementations, to help ensure the stability of the activation and deactivation determination, UE 105 uses a hysteresis activation timer between MDT measurement and deactivated, in order to ensure (and vice versa) MDT measurement switch between activated and deactivated It has elapsed or until a predetermined (e.g. by the network) configured duration. 返回图8A，如果配置了覆盖外激活阈值(框804)，则当UE 105正在失去覆盖时，如当UE 105从正常驻留转移至覆盖条件(例如受限驻留）时，或者从覆盖条件转移至覆盖外条件时，UE 105要执行PDP测量。  Back 8A, if the coverage activation threshold (block 804) configuration, the UE 105 when the cover is lost, such as when the UE 105 to transition from the normal resident coverage condition (e.g. limited camping), or transfer from the cover to the condition when the conditions of coverage, UE 105 to perform measurements PDP. 因此，如果配置了覆盖外阈值(框804)，则UE 105确定所驻留小区是否是唯一合适小区（框806)。 Thus, if the outer covering threshold (block 804) configuration, the UE 105 determines whether the cell is the only suitable cell resides (block 806). 如果所驻留小区是唯一合适小区（框806)，以及如果所驻留小区的信号强度、信号质量或两者变为劣于对应配置阈值(框808)，则UE 105启动定时器(框810)，并发起PDP测量和记录(框812)。 If the resident cell is the only suitable cell (block 806), and if the signal strength of the cell resides, or both signal quality becomes worse than a threshold value corresponding to the configuration (block 808), the UE 105 starts a timer (block 810 ), and initiates PDP measured and recorded (block 812). 在框810采用定时器以允许UE 105在初始进入覆盖外条件或无线条件开始改善时执行MDT测量，但是防止UE 105在UE 105保持覆盖外或长时间经历改善无线条件的情况下继续执行这种MDT测量（以及潜在地在该过程中不必要地浪费电池寿命和资源）。 This continues in block 810 using the timer to allow the UE 105 performs the MDT measurement upon initial entry of coverage condition, or radio condition begins to improve, but to prevent a case where the UE 105 or UE 105 holding the outer covering to improve the radio conditions experienced prolonged MDT measurement (and potentially and unnecessarily wastes battery life resources in the process). 在某个随后的时间，如果所驻留小区的信号强度或信号质量中的至少一个变为劣于上述第一覆盖外阈值或优于上述第二覆盖外阈值(框816)或定时器到期(框818)，则UE 105停止定时器，测量并记录(框820)。 At some subsequent time, if the signal strength or signal quality of a cell resides in the at least one becomes worse than the first threshold or better than the outer covering of the second outer cover threshold (block 816) or expiration of the timer (block 818), the UE 105 stops the timer, measured and recorded (block 820). 如果UE 105进入受限驻留模式，并且处于受限驻留模式的持续时间长于所配置的有效持续时间阈值(框822)，则UE 105保留所记录的MDT测量(框824)以随后在UE 105返回覆盖时报告。  If the UE 105 enters a restricted mode resides, and is active duration threshold (block 822) duration is longer than the limited camping mode configuration, the UE 105 the MDT measurement (block 824) to retain the recorded when UE 105 then reports back to coverage. 类似地，如果UE 105移至覆盖外，并且覆盖外的持续时间长于有效覆盖外持续时间阈值(框822)，UE 105保留所记录的MDT测量(框824)。 Similarly, if the UE 105 moves to an outer cover, and an outer cover is longer than the duration of the effective duration threshold of coverage (block 822), MDT measurement recording reservations UE 105 (block 824). 否则，UE 105删除与在框812处发起的MDT测量相对应的新近记录的MDT测量(框826)。 Otherwise, MDT measurements UE 105 deletes the MDT measurement initiated at block 812 corresponding to the newly recorded (block 826). 这种MDT测量删除可以由网络提供的MDT配置信息来配置。 This MDT MDT measurement configuration can delete the information provided by the network configuration. 在至少一些示例实现中，UE 105可以被配置为：如果例如UE 105长时间保持覆盖外，则在框820停止之后周期性重启MDT测量。  In at least some example implementations, UE 105 may be configured to: if for example the UE 105 for long periods of coverage, the MDT periodically measured after the restart block 820 is stopped. 例如，第二定时器可以被配置为实现等待时段。 For example, the second timer can be configured to implement the waiting period. 当第二定时器到期时，UE 105可以检查其是否仍在覆盖外（例如，如框808中，使用覆盖外激活阈值），如果是，则在框810中使用的第一定时器所跟踪的配置时段内重启和执行MDT 测量。 When the second timer expires, UE 105 may check whether it is still the outer covering (e.g., as in block 808, using the coverage activation threshold), if it is, the first timer is used in block 810 as tracked the configuration and restart execution MDT measurement period. 在配置时段内执行MDT测量之后，UE 105可以停止这种MDT测量，直到第二定时器跟踪的等待时段再次到期。 In the period after performing the MDT measurement configuration, UE 105 can stop this MDT measurement, waiting until the second timer period expires tracked again. 附加地或备选地，如果配置了返回覆盖阈值（图8B的框828)，则当UE 105处于受限驻留或覆盖外状态(框830)之后返回覆盖(例如从受限驻留返回正常驻留，或从覆盖外返回至覆盖状态）时，UE 105要执行PDP测量。  Additionally or alternatively, if the return coverage threshold (block 828 of FIG. 8B) configuration, when the UE 105 resides in the limited state or out of coverage (block 830) back to coverage (e.g., in restricted from when left to return to normal resident, or to return from an outer cover covering state), UE 105 to perform measurements PDP. 因此，如果UE105处于受限驻留或覆盖外状态（框830)，UE 105找到合适小区的候选(框832)并且该合适小区的信号强度、信号质量或两者变为优于对应配置的返回覆盖激活阈值(框834)，则UE 105启动定时器(框836)，并发起TOP测量和记录(框836)。 Thus, if the UE105 is limited camping or out of coverage state (block 830), UE 105 finds a candidate (block 832) and the signal strength of the appropriate cell of the appropriate cell, or both the signal quality becomes better return configuration corresponding to covering the activation threshold (block 834), the UE 105 starts a timer (block 836), and initiates TOP measured and recorded (block 836). 在随后的某个时间，如果框832中找到的小区并不合适(框840)，或者如果候选小区的信号强度和/或信号质量变为优于上述第一返回覆盖阈值或所有候选小区的信号强度和/或信号质量变为劣于上述第二返回覆盖阈值(框842)，或者如果定时器到期(框844)，则UE 105停止定时器、测量和记录(框846)。 In some later time, cover the first return signal threshold or if all candidate cells found in the cell block 832 is not appropriate (block 840), or if the signal strength of the candidate cells and / or signal quality becomes better than strength and / or signal quality becomes worse than the second threshold back to coverage (block 842), or if the timer expires (block 844), the UE 105 stops the timer, measured and recorded (block 846). 如果UE 105处于受限驻留模式，找到合适小区（框848)并且处于受限驻留模式的持续时间长于配置的有效持续时间阈值(框850)，则UE105保留所记录的MDT测量(框852)。  If the UE 105 resides in a restricted mode, to find a suitable cell (block 848) and is limited by the duration of stay mode valid duration longer than a threshold (block 850) configured to retain the UE105 MDT measurement recorded (block 852). 类似地，如果UE105找到合适小区（框848)并且覆盖外的持续时间长于有效覆盖外持续时间阈值(框850)，则UE 105保留所记录的MDT测量(框852)。 Similarly, if the UE105 find a suitable cell (block 848) and the outer cover is longer than the duration of the effective duration threshold of coverage (block 850), the retained MDT measurements 105 recorded (block 852) UE. 否则，UE 105删除与在框838发起的MDT测量相对应的新近记录的MDT测量(框854)。 Otherwise, MDT measurements UE 105 deletes the MDT 838 launched in the measurement box corresponding to the newly recorded (block 854). 这种MDT测量删除可以由网络提供的MDT配置信息来配置。 This MDT MDT measurement configuration can delete the information provided by the network configuration. 此外，如果UE105找到适于驻留的小区（框848)，则在满足一个或多个位置请求准则或备选地所有位置请求准则（如果在框804中获得的配置信息中存在）的情况下，UE 发起位置请求过程(框856)，如M0-LR，以获得位置信息(例如在分辨率比小区标识更精细的位置信息不可用的情况下）。 Further, if the cell is adapted to reside UE105 found (block 848), then in the case of satisfying one or more criteria or alternatively location request to request criteria for all positions (if the configuration information obtained in block 804 in the present) , the UE initiates a location request procedure (block 856), as M0-LR, to obtain the position information (e.g. in the case of a resolution finer than the cell identification information of the unavailable position). 在框856中发起的定位过程的类型可以取决于网络提供的MDT 测量配置。 Type initiated positioning procedure in block 856 may depend on the MDT measurement provided by the network configuration. 图8A-B中示意的过程800对应于以下示例实现，其中UE 105和网络支持覆盖外激活和去激活阈值以及返回覆盖激活和去激活阈值的配置。  Figures 8A-B are a schematic of the process corresponds to the example implementation 800 in which UE 105 and the network support and coverage activation and deactivation thresholds back to coverage activation and deactivation configurable threshold. 然而，在仅支持覆盖外激活和去激活阈值或者返回覆盖激活和去激活阈值的配置而不同时支持两者的示例实现中，过程800可以分为两个单独过程，其中图8A中利用覆盖外激活和去激活阈值的处理独立于图8B 中利用返回覆盖激活和去激活阈值的处理而执行。 However, only the outer cover supporting activation and deactivation threshold or return cover the activation and deactivation threshold is not configured to support both the exemplary implementation, process 800 may be divided into two separate processes, in which an outer cover utilized in FIG. 8A activation and deactivation threshold is independent of the use of FIG. 8B back to coverage activation and deactivation threshold value is performed. 换言之，在示例实现中，如果网络经由MDT配置信息预配置或配置对应阈值(或定时器），则执行上述每个阈值比较操作（以及时间比较操作）。 In other words, in an example implementation, if the network configuration information via the MDT pre-configuration or the corresponding threshold (or timer), perform the above operation for each threshold comparison (comparison operation and the time). 图9示意了使用图8A-B的过程800来标识网络覆盖空洞。  FIG. 9 illustrates the use of the process of Figures 8A-B 800 to identify the network coverage hole. 在图9的示例中，多个UE 905A-G正在从覆盖外区域910(也称为网络覆盖空洞910)转移回到一个或多个覆盖区域。 In the example of FIG. 9, a plurality of UE 905A-G are outside the coverage area 910 (also referred to as network coverage hole 910) is transferred back to the one or more coverage areas. 每个UE 905A-G被配置为执行过程800,并且已经接收到至少包括上述返回覆盖阈值的MDT配置。 Each UE 905A-G are configured to perform process 800 and has received the cover including at least the return MDT configurable threshold. 由于每个UE905A-G配置有返回覆盖阈值，在离开覆盖外区域910(由图9中的有向线表示)时，现9054-6开始执行根据过程800的1«几？ Since each UE905A-G disposed back to coverage threshold, when leaving the coverage area 910 outside (represented by having the lines in FIG. 9), 9054-6 now starts executing «1 process 800 in accordance with a few? 0?测量。 0? Measurement. 此外，在离开覆盖外区域910时，每个UE 905A-G发起位置请求过程并获得相应定位915A-G(例如对应于过程800的框856)。 Further, leaving of coverage area 910, each UE 905A-G initiates a location request procedure and obtain the corresponding positioning 915A-G (e.g. corresponding to block 856 of process 800). 如图9所示，网络可以使用定位915A-G的集合来映射覆盖外区域910。 9, the network may use the set locator 915A-G to map of coverage area 910. 图10中示意了UE 105可以执行以实现MDT移动性测量的第一示例过程1000。 In  FIG 10 illustrates a UE 105 may be performed to achieve a first example process 1000 MDT mobility measurements. 过程1000测量无线接入技术(RAT)之间的重选（即RAT间重选），并且可以用于标识表现出例如往复问题(其中UE 105在RAT之间过多转换）的问题区域。 Measurement process 1000 reselection between Radio Access Technology (RAT) (i.e., inter-RAT reselection), and may be used to identify problem areas such as reciprocating exhibit problems (where excessive transitions between UE 105 RAT),. 过程1000可以用于实现至少图6的一般过程600的一部分。 Process 1000 may be used to implement the general processes at least a portion 600 of FIG. 6. 转到图10,过程1000始于框1004,其中UE 105获得MDT测量配置信息， 该信息包括:过多RAT间重选激活阈值(例如要用作激活条件）、指定测量和记录持续时间(例如要用作去激活条件）、一个或多个过多RAT间重选去激活阈值、一个或多个位置请求准贝1J (例如一个或多个触发条件）、定位方法指示等等。 Turning to Figure 10, process 1000 begins at block 1004, where the UE 105 to obtain MDT measurement configuration information, the information including: inter-RAT reselection excessive activation threshold (e.g., to be used as an activation condition), and a recording duration specified measurement (e.g. deactivation conditions to be used), or a plurality of inter-RAT reselection excessive deactivation threshold, the one or more registration requests shellfish 1J positions (e.g. one or more trigger conditions), indicating the positioning method and the like. 然后，在框1008，UE 105对每单位时间的RAT改变次数进行计数(例如由于在配置信息中包括过多RAT间重选激活阈值）。 Then, at block 1008 counted, the number of RAT UE 105 changes per unit time (for example due to the configuration information included in the inter-RAT reselection excessive activation threshold). 如果所计数的RAT改变次数超过激活阈值(框1012)，则UE 105启动定时器(框1016)，并发起PDP测量和记录(框1020)。 If the counted number of changes RAT exceeds an activation threshold (block 1012), the UE 105 starts a timer (block 1016), and initiates PDP measured and recorded (block 1020). 尽管未示出，在确定用于触发框1008中对RAT改变计数的阈值时，还可以考虑UE的移动性状态(例如移动、速度等等）。 Although not shown, when it is determined in block 1008 for triggering the RAT change count threshold, it can be considered the mobility state of the UE (e.g. movement, speed, etc.). 当定时器到期(框1024)，或者每单位时间的RAT改变次数超过第一过多RAT间重选去激活阈值或每单位时间的RAT改变次数降至低于第二过多RAT间重选去激活阈值（框1024)时，UE停止测量和记录(框1028)，并存储可用TOP测量结果。  When the timer expires (block 1024), or the RAT change per unit time the number exceeds a first inter-RAT reselection excessive deactivation threshold or the number of times per unit time falls below a second RAT change too RAT when inter reselection deactivation threshold (block 1024), UE stops measured and recorded (block 1028), and stores the measurement results available TOP. 例如，如果满足第一过多RAT间重选去激活阈值，则UE 105可能经历了RAT间往复问题。 For example, if the first to meet the excessive inter-RAT reselection deactivation threshold, the UE 105 may undergo inter-RAT reciprocally problem. 然而，如果满足第二过多RAT 间重选去激活阈值，则UE的RAT间小区重选行为可能返回至正常。 However, if too much of the second inter-RAT reselection deactivation threshold is satisfied, the inter-RAT cell reselection, the UE may return to normal behavior. 如果分辨率比小区标识等级更精细的位置信息不可用，UE发起位置请求过程(框1032)，如果配置了位置请求准则并且满足一个或多个或者备选地所有所配置位置请求准则，则可以触发该位置请求过程。 If the resolution is finer than a cell identification level location information is not available, the UE initiates a location request procedure (block 1032), if the configuration and location request satisfies one or more criteria or alternatively all of the configured location request criteria, may be the process is triggered location request. 当在两个或三个最频繁重选的小区之间发生RAT间重选时，UE 105可以发起位置请求过程。 When the inter-RAT reselection occurs between two or three of the most frequent cell reselection, UE 105 may initiate position request procedure. 是否以及如何在框1032发起定位过程可以取决于网络提供的MDT测量和记录配置信息。 Whether and how to initiate a positioning process in block 1032 may depend on the MDT measurement and logging provides network configuration information. 然后， UE 105在框1036报告所记录的测量数据和定位信息。 Then, UE 105 at block 1036 reports the measurement data and the recorded location information. 当例如在3GPP通信系统100中采用空闲模式信号抑制（ISR)时，过程1000可以是有益的，因为网络可能不能检测到UE 105进行的频繁RAT改变。 When employed, for example, an idle mode suppression signal (ISR) in the 3GPP communication system 100, process 1000 may be beneficial, since the network may not be detected for UE 105 frequently changes the RAT. 即使在不使用ISR时，过程1000仍可以用于标识与过多RAT重选相关联的问题区域。 Even when not in use ISR, process 1000 may be used to identify still too RAT reselection problems associated with the area. 图11中示意了UE 105可以执行以实现MDT移动性测量的第二示例过程1100。 In  FIG 11 illustrates a UE 105 may be performed in the process of implementing a second exemplary MDT mobility measurements 1100. 过程1100测量RAT内（同频或异频）小区重选，并且可以用于标识表现出例如往复问题（其中UE 105在特定RAT的小区之间过多转换）的问题区域。 RAT measurements over the course of 1100 (inter-frequency or intra-frequency) cell reselection, and may be used to identify problem areas such as reciprocating exhibit problems (excessive wherein UE 105 transitions between a particular RAT cell). 过程1100可以用于实现至少图6的一般过程600的一部分。 Process 1100 may be used to implement the general processes at least a portion 600 of FIG. 6. 转到图11，过程1100始于框1104，其中UE 105获得MDT测量配置信息，该信息包括:一个或多个过多小区重选激活阈值(例如要用作激活条件，并且可以包括针对同频和异频小区重选的不同阈值）、指定测量和记录持续时间（例如要用作去激活条件）、一个或多个过多小区重选去激活阈值、一个或多个位置请求准则(例如一个或多个触发条件）、定位方法指示等等。 Turning to Figure 11, process 1100 begins at block 1104, where the UE 105 to obtain MDT measurement configuration information, the information including: one or more cell reselection excessive activation threshold (e.g., to be used as an activation condition, and may include for intra-frequency and the different thresholds of the inter-frequency cell reselection), and a recording duration specified measurement (e.g. deactivation conditions to be used), one or more excessive cell reselection deactivation threshold, the one or more location request criteria (e.g. a or more trigger conditions), indicating the positioning method and the like. 然后，在框1108，UE 105对每单位时间的小区次数进行计数(例如由于在配置信息中包括过多小区重选激活阈值）。 Then, at block 1108, UE 105 counts the number of cells per unit time (for example due to the configuration information included in the cell reselection excessive activation threshold). 如果所计数的小区重选次数超过激活阈值(框1112)，则UE 105启动定时器(框1116)，并发起TOP测量和记录(框1120)。 If the counted number of cell reselections exceeds an activation threshold (block 1112), the UE 105 starts a timer (block 1116), and initiates TOP measured and recorded (block 1120). 尽管未示出，在确定用于触发框1108中对小区重选计数的阈值时，还可以考虑UE的移动性状态(例如移动、速度等等）。 Although not shown, when it is determined in block 1108, for triggering the cell reselection threshold count value, it can be considered the mobility state of the UE (e.g. movement, speed, etc.). 当定时器到期(框1124)，或者小区重选次数超过第一过多小区重选去激活阈值或小区重选次数降至低于第二过多小区重选去激活阈值(框1124)时，UE停止测量和记录(框1128)，并存储可用TOP测量结果。  When the timer expires (block 1124), or cell reselection number exceeds a first cell reselection excessive deactivation threshold frequency cell reselection or falls below a second excessive cell reselection deactivation threshold (block 1124) is, the UE stops measured and recorded (block 1128), and stores the measurement results available TOP. 如果分辨率比小区标识等级更精细的位置信息不可用，在满足一个或多个位置请求准则的情况下，UE发起位置请求过程(框1132)。 If the resolution is finer than a cell identification level location information is not available, in the case of location request satisfies one or more criteria, the UE initiates a location request procedure (block 1132). 例如，一个位置请求准则可以是每单位时间的小区重选次数超过第一去激活阈值。 For example, a location request may be a criterion per time frequency cell reselection threshold value exceeds a first deactivation. 当UE 105在两个或三个最频繁重选的小区之间执行小区重选时，可以触发这种位置请求。 When the UE 105 performs a cell reselection between the two or three most frequent cell reselection, this location request may be triggered. 是否以及如何发起框1132 的定位过程可以取决于网络提供的MDT测量和记录配置信息。 Whether and how to initiate a positioning process block 1132 may depend on the MDT measurement and logging provides network configuration information. 然后，UE 105在框1136报告所记录的测量数据和定位信息。 Then, UE 105 at block 1136 the measured data and positioning information recorded. 图12中示意了UE 105可以执行以实现MDT定位测量的第一示例过程1200。  FIG. 12 illustrates a UE 105 may be performed in a first example implementation process 1200 MDT positioning measurements. 过程1200可以用于实现至少图6的一般过程600的一部分。 Process 1200 may be used to implement at least a part of the general process 600 of FIG. 6. 定位/位置测量或估计应当具有充分精细的分辨率以标识覆盖空洞，如图9所示的覆盖空洞910。 Location / position should be measured or estimated with sufficient resolution to identify a fine coverage holes, a coverage hole 910 as shown in FIG. 9. 然而，由于对UE电池寿命的影响，不期望长期保持UE定位硬件激活。 However, due to the impact on UE battery life, do not expect long-term UE positioning hardware activated. 此外，由于UE通常是移动的，获取位置信息的延迟应当充分小，以使得能够精确标识覆盖空洞的边缘(例如在UE已经从覆盖空洞的边缘移开较大距离之前）。 Further, since the UE is typically a mobile, the position information is acquired delay should be sufficiently small to enable the precise identification of the edge of the hollow cover (e.g., before the UE has a large distance away from the edge of the coverage hole). 基于这种考虑，仅当需要时或者在用于检测覆盖问题的相关时间，过程1200可以用于执行较精细分辨率的定位技术，如GPS/GNSS或0TD0A。  Based on this consideration, only when necessary at the relevant time, or for detecting a coverage problem, process 1200 may be used to perform finer resolution positioning technology, such as GPS / GNSS or 0TD0A. 例如，参照图9的示例，过程1200 在框1204获得定位配置信息，这使得:UE 105在处于受限驻留状态或者覆盖外（框1208和1202)之后找到合适小区并且例如满足任何位置请求准则（如果配置了这种准则）时，UE 105执行较精细分辨率的定位。 For example, with reference to the example of FIG. 9, process 1200 is positioned at block 1204 to obtain configuration information, which makes: UE 105 resides in the limited state or in to find a suitable cell after the outer cover (blocks 1208 and 1202) and any location request satisfies criteria e.g. (if such a configuration criteria), UE 105 performs positioning finer resolution. 由于当UE 105在覆盖外时，UE 105不能获得辅助数据，过程1200使得:UE 105在UE 105回到覆盖区域时而不是在UE 105移至覆盖外时执行定位测量。 Because when the UE 105 at an outer covering, UE 105 can obtain assistance data, such that process 1200: UE 105 back to UE 105 in coverage area sometimes not performed when the UE 105 is positioned to move the measurement of coverage. 通过从许多UE收集这种位置信息，3GPP通信系统100的运营商可以标识其网络中的覆盖空洞，如图9的覆盖空洞910。 This position information collected from a number of UE, 3GPP operator of communication system 100 may identify its coverage holes in the network, coverage hole 9109 of FIG. 为了确定与小区之间的过多往复相关联的区域，过程1200使得:仅当满足所配置的位置请求准则时(在所示示例中对应于:在每单位时间的重选次数方面超过阈值之后，在特定数目（例如两个或三个)最多重选小区之间进行的小区重选）（框1216)，UE 105执行较精细分辨率的定位。  In order to determine a region associated with excessive reciprocating between cells, process 1200 such that: only when the position of the configured request satisfies the criteria (in the illustrated example corresponding to: number reselection per unit time aspects after exceeding the threshold value, a maximum cell reselection between a cell for a particular number of (e.g. two or three) reselection) (block 1216), UE 105 performs positioning finer resolution. 此外，UE 105记录检测到覆盖内小区和定位信息可用之间的时间（框1220)。 Furthermore, UE 105 detects that the recording time (block 1220) between the inner cover and the cell location information is available. 该时间以及其他移动性相关信息可以帮助运营商评估覆盖空洞边缘的精度(例如通过确定从确定定位信息起UE 105可能已经移动多远）。 The time and other mobility related information to help operators to evaluate the overlay accuracy of the edge of the cavity (e.g., UE 105 may have moved far from the location information is determined by determining onwards). 图13示意了网络单元（如eNB 305)可以执行以配置UE 105中的MDT定位测量的示例过程1300。  FIG. 13 illustrates a network element (e.g., eNB 305) can perform an example configuration procedure to UE 105 MDT positioning measurement in 1300. 例如，过程1300可以用于配置在UE 105中执行过程1200,或者可以用作过程1200的备选。 For example, process 1300 may perform process 1200 for configuring the UE 105, or may be used as an alternative to process 1200. 过程1300可以用于实现至少图7的一般过程700的一部分。 Process 1300 may be used to implement at least a part of the general process 700 of FIG. 7. 转到图13,过程1300 实现两阶段定位测量技术，第一阶段在框1304进行，其中网络(例如经由网络管理器210或310)通过取得无线链路失败的统计特性以及然后创建与问题区域相关联的小区列表，在小区标识等级标识问题区域(例如覆盖空洞910)。 Turning to Figure 13, process 1300 to achieve a two-stage position measurement technique, the first stage at block 1304, wherein a network (e.g., via the network manager 210 or 310) is then created by taking the statistical properties of radio link failure related to the problem areas linked cell list, the cell identifier identifies a problem area level (e.g., a coverage hole 910). 然后，在第二阶段，eNB305针对所标识的问题区域附近的UE进行迭代(框1308)，当处于连接模式的UE(例如UE 105)进入该区域时（框1312)，网络可以配置MDT测量和记录，并激活较精细分辨率定位(框1316)。 Then, in a second stage, the iterative eNB 305 (block 1308) for the vicinity of the identified problem areas the UE, when (block 1312) UE (e.g. UE 105) in connected mode, enter the area, the network may configure MDT measurement, and records, and activating finer resolution positioning (block 1316). 对于小区选择和重选度量，eNB 305可以就在处于该区域中的UE(例如UE 105)正在返回空闲模式(框1320) 之前，配置在空闲模式下执行MDT测量和记录。 For cell reselection measurement and selection, eNB 305 may be in the region in the UE (e.g. UE 105) prior to returning the idle mode (block 1320), and configured to perform MDT measurement recorded in the idle mode. 此外，网络可以经由专用信令寻呼所标识的问题区域中的空闲模式UE(框1324和1328)，以配置MDT测量、记录和较精细分辨率定位(框1316)，然后允许UE返回空闲模式。 In addition, the network may issue the UE via dedicated signaling paging area identified in idle mode (block 1324 and 1328) to configure MDT measurement, recording, and finer resolution positioning (block 1316), then allowed to return to the idle mode UE . 附加地或备选地，对于处于空闲模式的UE，网络可以在问题区域内和/或周围的小区中，在系统信息中广播针对MDT测量和记录的配置信息（未示出）。 Additionally or alternatively, the UE in idle mode, the network may be in the problem areas and / or around a cell broadcast (not shown) for the MDT measurement configuration information and recorded in the system information. 在问题区域中和/或周围这样使用系统信息来广播MDT配置可以避免需要网络针对所标识的问题区域(框1308)附近的UE进行迭代以配置处于连接模式的UE进行MDT测量。 Problem areas and / or using the system information such peripheral broadcast MDT configuration to avoid the need to iterate the network for the UE close to the problem area (block 1308) to configure the identified UE is in connected mode MDT measurement. 图14中示意了UE 105可以执行以实现MDT定位测量的第二示例过程1400。  FIG 14 illustrates a UE 105 may be executable to implement a second exemplary process 1400 MDT positioning measurements. 过程1400可以用于实现至少图6的一般过程600的一部分。 Process 1400 may be used to implement the general processes at least a portion 600 of FIG. 6. 过程1400在框1404从网络获得定位配置信息，这使得：当满足一个或多个指定准则时(框1408)，UE 105建立RRC连接。 Process 1400 to obtain configuration information from the network positioning block 1404, which makes: When (block 1408) satisfy one or more specified criteria, UE 105 establish an RRC connection. 这种准则的示例（例如可以使用事件标识/描述符来指定)包括:UE 105返回覆盖、重选次数超过阈值、 UE 105进入与例如特定小区列表、UTRAN注册区域(URA)、位置区域(LA)、路由区域(RA)、跟踪区域(TA)相对应的特定区域等等。 Examples of such criteria (for example, using an event identifier / descriptor specified) comprising: UE 105 returns covered reselection number exceeds a threshold, UE 105 enters for example, a particular cell list, the UTRAN registration area (URA), location area (LA ), routing area (RA), a tracking area (TA) corresponding to a specific area and the like. 在示例过程1400中，网络在框1404获得的配置信息中指定概率因子，以限制针对MDT目的而建立的RRC连接的数目。 In the example process 1400, the network configuration information obtained in block 1404 specify the probability factors to limit the number of RRC connection established for the purpose of MDT. 因此，UE 105产生随机数(框1416)，如果该数大于（或备选地小于）指定概率因子(框1420)，则UE发送RRC连接请求(框1424)。 Thus, UE 105 generates a random number (block 1416), if the number is greater than (or alternatively, less than) the specified probability factor (block 1420), the UE transmits an RRC connection request (block 1424). 例如，该概率因子值可以包括在网络向UE 105提供的系统信息、重新配置消息或RRC 连接释放消息中。 For example, the system may include a probability factor value information provided to the UE 105, the network reconfiguration message or an RRC connection release message. 如果概率因子是用于建立RRC连接的唯一准则，则小区中心附近的UE可以在UE产生的随机数大于（或备选地小于）指定概率因子的情况下建立连接。  If the probability factor is a random number only criterion for establishing an RRC connection, the vicinity of the cell center UE may be generated in the UE is greater than (or alternatively, less than) the specified probability factor in the case of establishing a connection. 然而，小区中心附近的UE可能无助于标识覆盖问题。 However, in the vicinity of the cell center UE may not help identify coverage problems. 为了使大部分由小区边缘附近的UE执行测量，除了概率因子之外，网络可以在框1404获得的配置信息中提供针对信号强度、信号质量、路径损耗等等的阈值，以总体上仅允许小区边缘附近的UE能够建立RRC连接以进行MDT测量报告。 In order to perform most of the vicinity of the cell edge measured by the UE, in addition to the probability factor, the network may provide a threshold value for signal strength, signal quality, pathloss, etc. in the configuration information obtained in block 1404, to generally allow only cells near the edges of the UE can establish an RRC connection for MDT measurement report. 例如，如果配置了信号强度阈值，则UE 105测量服务小区或所驻留小区的信号强度。 For example, if the signal strength threshold configuration 105 measures the signal strength of the serving cell or cell resides UE. 如果测量优于阈值(框1428)，则UE 105将不发起RRC连接；否则，UE 105可以被允许发起RRC连接(框1424) (可能取决于其他准则）。 If the measured value is better than the threshold (block 1428), the UE 105 will not initiate an RRC connection; otherwise, UE 105 may initiate an RRC connection is allowed (block 1424) (may depend on other criteria). 例如，网络还可以在框1404获得的配置信息中指定所需定位能力， 例如辅助GPS、0TD0A等等。 For example, the network may also specify the required positioning capability in the configuration information obtained in block 1404, for example assisted GPS, 0TD0A like. 如果UE 105不具有指定能力（框1432)，则UE 105将不发起RRC连接；否则UE 105发起RRC连接(框1424)。 If the UE 105 does not have the ability to specify (block 1432), the UE 105 will not initiate an RRC connection; otherwise, UE 105 initiates an RRC connection (block 1424). 可以利用RRC连接请求消息中针对MDT测量的特定建立原因值或者RRC连接建立完成消息中用于指示MDT测量的信息单元来区分在框1424针对MDT测量目的建立的RRC连接。  may be utilized to establish the RRC connection request message for the cause value specific MDT measurement RRC connection setup complete message or a message for instructing means MDT measurement to differentiate the RRC connection establishment for block 1424 MDT measurement purposes. 当网络接收到具有MDT指示的RRC连接请求或RRC连接建立完成时，例如，网络配置以下选项中的任一个。 When the network receives the RRC connection request or RRC connection setup indication MDT has completed, e.g., a network configuration according to any one of the following options. 选项1:在框1436，UE 105获得配置信息以开始周期性定位测量，如增强小区标识(E-CID)、GPS/GNSS、0TD0A等等。  Option 1: In block 1436, UE 105 periodically obtains configuration information to start positioning measurements, such as enhanced cell identity (E-CID), GPS / GNSS, 0TD0A like. 网络还可以开始测量从UE105接收的信号的角度以及任何定时延迟，并估计UE 105的位置。 The network may also start measuring the delay from the perspective of the received signal and UE105 any timing, and estimate the position 105 of UE. 网络测量和UE定位测量可以组合以产生更精确的位置信息。 Network measurement and UE positioning measurements can be combined to produce a more accurate location information. 选项2:在框1436，UE 105获得配置信息以开始周期性定位测量，但是与选项1不同，可以在空闲模式下执行定位测量，并且记录而不报告测量。  Option 2: In block 1436, UE 105 periodically obtains configuration information to start positioning measurements, but with a different option, the positioning measurements may be performed in the idle mode, without recording and reporting measurement. 示例定位方法包括例如E- CID、GPS/GNSS、OTDOA等等。 Example positioning methods include, for example E- CID, GPS / GNSS, OTDOA like. 在配置期间可以提供辅助数据(如果可用）。 It may provide assistance data (if available) during configuration. 定位测量可以在释放RRC连接时开始，或者进一步推迟直到满足特定条件(例如当UE移至覆盖外或者UE回到覆盖时）。 Positioning measurements can be started when the RRC connection is released, or further delayed until a specific condition is satisfied (e.g., when the UE moves out of coverage or when the UE back cover). 关于E-CID或0TD0A测量，UE 105可以在RRC连接建立完成消息中报告特定数目的最佳小区，使得网络可以选择最优小区集合用于定位测量。  For E-CID or 0TD0A measurement, UE 105 may be connection setup complete message reporting the best cell in a certain number of RRC, so that the network can select the optimal cell for positioning a set of measurements. 在至少一些示例操作场景中，当执行过程1200和/或1400时，如果UE105进入覆盖空洞(例如覆盖空洞910)，具有较精细分辨率的定位信息可能已经与小区测量一起可用，或者UE 105可以通过使用与配置信息一起提供的辅助数据来开始所配置的定位测量，以立即获得位置信息，从而实现位置信息的低延迟获取。  In at least some example operating scenario, when performing process 1200 and / or 1400, if the UE105 enters a coverage hole (e.g., a coverage hole 910) having a finer resolution of positioning information may already be available together with the measurement cell, or UE 105 may start by using the auxiliary data provided with the configuration information configured by positioning measurements, to obtain position information immediately available low latency, thereby achieving position information. 在至少一些操作场景中，由于UE移动或者时间流逝，向UE 105提供用于定位测量的辅助数据可以变为过期。 In at least some operating scenarios, the time elapsed since the UE moves or providing assistance data for positioning measurement to the UE 105 may become outdated. 如果提供辅助数据的参考小区不同于UE 105的当前驻留小区或服务小区，则辅助数据也可能变为过期。 If the reference cell provide assistance data is different from the serving cell or UE is currently camped cell, then the auxiliary data 105 may become outdated. 在这种场景中，UE 105可能需要请求新辅助数据。 In this scenario, UE 105 may need to request a new assistance data. 因此，针对MDT的定位测量可以配置有有效性定时器(例如10分钟）和/或辅助数据有效的有效区域。 Therefore, positioning measurements for MDT may be configured with a validity timer (e.g., 10 minutes) and / or the effective area of ​​the auxiliary data is valid. 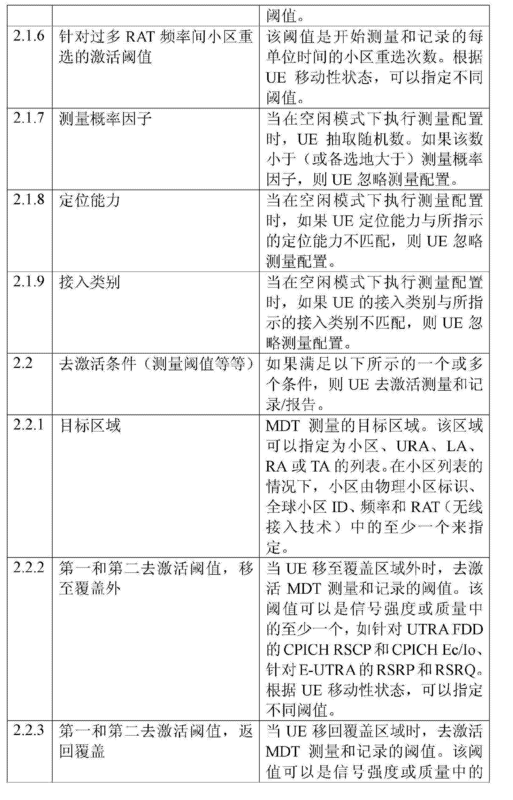 有效区域可以由小区或URA的列表来指定。 Effective area may be specified by listing the cell or URA. 前述定位测量技术的另一优点在于：可以基于UE的定位能力来选择用于MDT目的的定位技术。  Another advantage is that the positioning of the measurement technique: positioning techniques may be selected for the purpose of MDT-based positioning capabilities of the UE. 例如，如果UE 105和网络均支持UE辅助的GPS、基于UE的GPS和0TD0A，则网络可以根据所需辅助数据量和从首次定位起已经过去的预期时间来选择0TD0A优先于UE辅助的GPS优先于基于UE的GPS。 For example, if the UE 105 and UE support network assisted GPS, a GPS-based and 0TD0A UE, the network can be selected 0TD0A GPS priority takes precedence over the UE-assisted aid according to the amount of data required from time to first fix and expected time has elapsed since the based on the GPS UE. 前述示例中的一些利用M0-LR过程来确定定位信息。  Some of the foregoing examples using M0-LR procedure to determine location information. 图15示意了可以用于实现用于图1的3GPP通信系统100中的MDT测量的位置请求处理的示例M0-LR过程1500。 FIG 15 illustrates an example may be implemented for M0-LR procedure MDT measurement 100 3GPP communication system of FIG. 1 processing location request 1500. 图16示意了消息序列图1600,示出了过程1500的示例操作。 Figure 16 illustrates a message sequence diagram 1600 illustrates an exemplary process 1500 of operation. 在至少一些操作场景中，M0-LR过程1500比传统M0-LR过程更加高效，因为M0-LR过程1500主要在RAN(例如由图16中的RAN1605所表示） 中进行管理，而核心网（CN，由图16中的CN 1610所表示）只有有限涉及，核心网包括UMTS中的移动交换中心(MSC)和服务GPRS支持节点（SGSN)、长期演进(LTE)增强分组核心(EPC)中的MME和增强服务移动位置中心(E-SMLC)等等。 In at least some operating scenarios, M0-LR process 1500 is more efficient than the conventional M0-LR procedure as M0-LR process 1500 mainly in the RAN (e.g. as represented in FIG. 16 RAN1605) managed in the core network (CN , is represented by FIG. 16 CN 1610) only limited it relates to the core network includes a mobile switching center (MSC) UMTS in and serving GPRS support node (the SGSN), long term evolution (LTE) enhanced packet core (EPC) of MME and enhanced serving mobile location center (E-SMLC), and so on. 此外，M0-LR过程1500比传统M0-LR过程更早向UE 105提供辅助数据，潜在地以减小的延迟实现了位置信息的高效获取。 Further, M0-LR than the conventional process 1500 M0-LR procedure earlier provide assistance data to UE 105, to reduce potentially delayed achieve efficient acquisition of the position information. 参照图15和16，分别在框1514和1614，网络使用例如RRC连接重新配置、RRC连接释放、系统信息等等来执行第一MDT测量（和记录）配置。  Referring to FIGS. 15 and 16, respectively, at block 1514 and 1614, for example, a network reconfiguration RRC connection, the RRC connection release, system information, etc. to perform the first MDT measurement (and record) configuration. 在所示示例中，第一MDT测量配置1514、1614针对指定目标地理区域，并配置UE 105在进入该指定地理区域时建立RRC连接。 In the illustrated example, a first measurement configuration 1514,1614 MDT for targeting geographic area and configured to establish an RRC connected UE 105 upon entering the designated geographic area. 接下来，在框1518，UE 105进入指定地理区域，并建立RRC连接1618,其中建立指示目的为MDT测量。  Next, at block 1518, UE 105 enters the designated geographic area and establishes an RRC connection 1618, which indicates the purpose of establishing MDT measurement. MDT测量建立指示可以在RRC连接请求或RRC连接建立完成消息中传送。 MDT measurement indication may establish a connection request or RRC connection setup complete message transmitted in the RRC. 响应于MDT测量建立指示，网络可以决定绕过认证或其他安全过程。 In response to MDT measurement establishment indication, the network may decide to bypass authentication or other security procedures. 此外，UE 105可以在RRC连接建立完成消息中指示其定位能力，提供服务小区和相邻小区的测量等等。 Furthermore, UE 105 can be in the RRC connection setup complete message indicating its positioning capabilities, the serving cell and to provide measurements of neighboring cells and the like. 在示例实现中， 小区测量是服务小区和相邻小区的信号强度或信号质量中的至少一个。 In an example implementation, the cell measurement is a signal strength or signal quality of the serving cell and neighboring cells in at least one. 接下来，在框1522,网络确定是否应当执行第二MDT配置或正常无线资源管理(RRM)定位测量。  Next, at block 1522, the network determines whether the second MDT configuration or normal radio resource management (RRM) positioning measurements should be performed. 如果要执行正常RRM定位，网络配置合适的RRM测量，并且过程结束（图中未示出）。 To perform RRM properly positioned, the appropriate RRM measurement network configuration, and the process ends (not shown). 如果网络决定执行用于MDT定位测量的第二MDT配置，则网络可以根据服务小区和UE 105的定位能力，在MD頂S置中包括定位/位置请求。 If the network decides to perform the second MDT configured MDT positioning measurements, then the network can service cells and UE positioning capability 105, including the top MD positioned in opposing S / location request. 如果需要辅助数据(框1526)，网络向UE 105传送辅助数据（表示为图16中的框1626)。 If an auxiliary data (block 1526), ​​the network 105 transmits the assistance data to UE (as represented by block 1626 in FIG. 16). 为了降低网络负载，RAN 1605(例如LTE中的eNB 305或UTRAN中的RNC)可以在每个小区或小区子集中临时高速缓存辅助数据。 To reduce network load, RAN 1605 (e.g. the RNC LTE eNB 305 or the UTRAN) can concentrate the temporary cache auxiliary data in each cell or sub-cell. 如果在RAN 1605中有效辅助数据可用于UE 105(框1530)，则经由辅助数据传送1634从RAN的高速缓存向UE提供辅助数据(框1534)。 If the UE 105 can be used (block 1530) in the auxiliary data valid RAN 1605, provides assistance data (block 1534) from the RAN to the UE via the secondary cache 1634 data transfer. 否则，网络经由从CN 1610 (例如从UTRAN中的SMLC或RNC， 或从EPC/LTE中的E-SLMC，使用LTE定位协议A(LPPa))至RAN 1605的辅助数据传送1638请求新的辅助数据，然后辅助数据传送1638将辅助数据传送至UE 105(框1538)。 Otherwise, via the network from the CN 1610 (e.g. from the UTRAN in the SMLC or the RNC, or from EPC / LTE in the E-SLMC, using LTE positioning protocol A (LPPa)) to the RAN supplementary data 1605 1638 requests a new assistance data and transmitting the auxiliary data is transmitted to the auxiliary data 1638 UE 105 (block 1538). 在始于框1522、1626的第二MD頂S置中，在框1522,网络还可以经由测量控制消息、 RRC连接重新配置消息、RRC连接释放消息或专用消息来配置定位测量/估计和记录。  In a second begins at block 1522,1626 top MD S is set, at block 1522, via the network may also be a measurement control message, the RRC connection reconfiguration message, the RRC connection release message or a dedicated message to configure the positioning measurements / estimates and records. 该消息可以包含辅助数据，而不是如辅助数据传送1634中那样将其单独发送。 The message may contain auxiliary data, as will be transmitted instead of 1634 as in the auxiliary data transfer alone. 用于执行第二MDT测量的消息指定激活测量和报告/记录的条件、测量操作的持续时间等等。 Performing a second MDT measurement message for specifying measurement and reporting activation / recording conditions, the duration of the measurement operation and the like. 如上所述，激活条件可以是在覆盖外时、回到覆盖时、回到空闲状态时等等。 As described above, when the activation condition may be out of coverage, when the back cover, and so on back to the idle state. 接下来，在框1546,网络执行RRC连接释放1646。  Next, at block 1546, the network performs RRC Connection Release 1646. 然后，在框1550、1650，UE 105使用过程1200或1400或者任何其他定位/位置测量过程中的任一个，开始执行定位测量并记录测量以及其他小区测量和加时间戳。 Then, at block 1550,1650, UE 105 using process 1200 or 1400 or any other positioning / position measuring process according to any one starts executing the positioning and records measurements and other measurements and timestamping cells. 图17示意了UE 105可以执行以执行增强小区标识(E-CID)定位测量的示例过程1700。  FIG 17 illustrates a UE 105 may perform an example process to perform enhanced cell identity (E-CID) positioning measurements 1700. 过程1700可以用于实现图6的一般过程600的至少一部分。 Process 1700 may be used to implement the general processes at least a portion of FIG. 6 600. 对于使用过程1700的E-CID 定位，UE 105获得上述定位配置信息（框1704)。 For E-CID positioning process 1700, UE 105 obtain the above positioning configuration information (block 1704). 然后，如果配置信息包括针对E-CID要测量的小区集合(框1708)，则UE 105测量网络指示的小区（框1712)。 Then, if the configuration information comprises a set (block 1708) for E-CID cell to be measured, the measurement network 105 indicative of the cell (block 1712) then the UE. 如果网络未指示小区（框1708)，则UE 105可以选择已经注册或属于所选公共陆地移动网络(PLMN)的小区的集合(框1716)。 If the network does not indicate the cell (block 1708), the UE 105 may select or set of cells belonging to the selected registered public land mobile network (PLMN) (block 1716). 然后，UE 105记录小区标识和所测量小区的信号强度或信号质量中的至少一个，以用于后处理(框1720)。 Then, UE 105 records a cell identification and signal strength or signal quality measurement of at least one cell, for post-processing (block 1720). 如果UE 105处于连接模式(框1724)，除了在框1720记录的信息之外， UE可以测量并记录服务小区和相邻小区的发送-接收时间差。 If the UE 105 is in connected mode (block 1724), in addition to the information recorded in block 1720, the UE may measure and record the serving cell and neighbor cell transmission - reception time difference. 图18示意了UE 105可以执行以执行GPS/GNSS定位测量的示例过程1800。  FIG 18 illustrates a UE 105 may perform an example process to perform GPS / GNSS positioning measurements 1800. 过程1800 可以用于实现图6的一般过程600的至少一部分。 Process 1800 may be used to implement at least a part of the general process 600 of FIG. 6. 对于使用过程1800的GPS/GNSS定位，UE 105获得上述定位配置信息(框1804)。 For use GPS / GNSS positioning 1800, UE 105 obtain the above positioning configuration information (block 1804). 然后，UE 105记录其GPS/GNSS接收机内的GPS/GNSS模数转换器(ADC)输出、卫星标识信息、一个或多个时间戳、服务(归属)小区或驻留小区的标识等等(框1808)。 Then, UE 105 records GPS / GNSS analog to digital converter (ADC) within its GPS / GNSS receiver output, the satellite identification information, one or more timestamps, service identification (home) cell and the like or resident cells ( box 1808). 然后，UE 105报告所记录的信息（框1812)。 Then, UE 105 reports recorded information (block 1812). 此后，网络位置服务器可以扫描所记录的数据，以利用时间和小区级位置信息来检测来自GPS卫星的信号(框1816)。 Thereafter, the network location server may scan the recorded data, time, and to use the position information to detect the cell signal level (block 1816) from the GPS satellites. 如果检测到充足数目的卫星，网络位置服务器可以计算UE 105的位置(框1816)。 If a sufficient number of satellites detected, the network location server may calculate the position of UE 105 (block 1816). 图19示意了UE 105可以执行以执行0TD0A定位测量的示例过程1900。  FIG 19 illustrates a UE 105 may perform an example process to perform positioning measurements 0TD0A 1900. 过程1900可以用于实现图6的一般过程600的至少一部分。 Process 1900 may be used to implement at least a part of the general process 600 of FIG. 6. 对于使用过程1900的0TD0A定位，UE 105获得上述定位配置信息（框1904)。 For the process of positioning 0TD0A 1900, UE 105 obtain the above positioning configuration information (block 1904). 然后，UE 105确定和记录目标小区与辅助数据中包含的参考小区或者UE105选择的其他小区之间的帧时间差以及时间戳，以用于后处理（框1908)。 Then, the time frame between the other cells and the UE 105 determines a target record the reference cell and the auxiliary cell contains data or selected UE105 difference and a time stamp, for post-processing (block 1908). 然后，UE 105报告所记录的信息（框1912)。 Then, UE 105 reports recorded information (block 1912). 此后，网络位置服务器对所报告的0TD0A信息进行后处理，以确定在所记录的时间戳处UE的位置。 Thereafter, the network location server 0TD0A information reported post-treatment to determine the location of the UE at the timestamp recorded. 在前述示例中，网络位置服务器可能需要在测量获取之后的特定时段内处理定位测量，以计算精确的位置估计。  In the foregoing example, the network location server may handle positioning measurements for a certain period after the acquisition of the measurement to calculate an accurate position estimate. 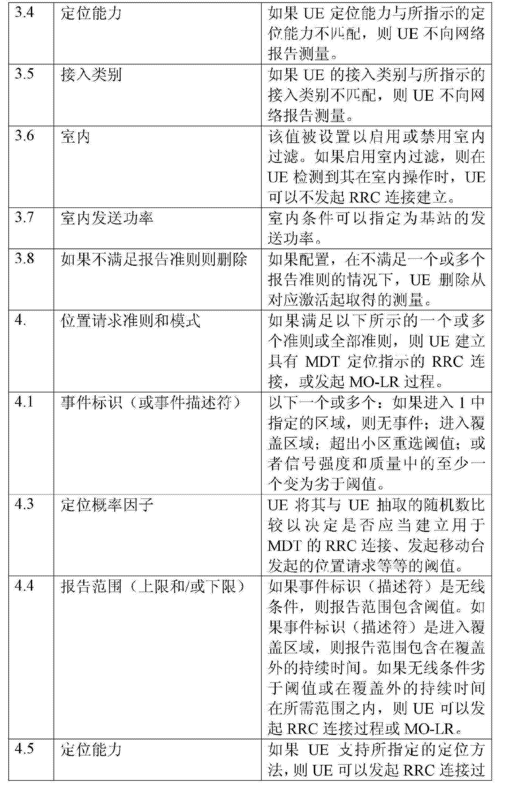 UE 105可以建立RRC连接，具有特定建立原因"MDT报告"，或在RRC连接建立完成中指示"MDT报告"以提供定位测量。 UE 105 can establish an RRC connection establishment cause having a specific "MDT Report", or the RRC connection setup complete indication in the "MDT report" to provide a positioning measurements. 对于覆盖优化，运营商的主要兴趣可能是宏（即室外)覆盖。  for coverage optimization, the main interest of the operator may be a macro (ie outdoor) coverage. 因此，在一些示例场景中，当UE 105处于室内时，应当避免MDT测量和记录或报告，和/或eNB 305或MDT网络管理器310应当能够避免或过滤与UE105室内操作相对应的测量数据。 Thus, in some example scenario, when the UE 105 is indoors, it should be avoided MDT measurement and logging or reporting, and / or eNB 305 or MDT network manager 310 should be able to be avoided or filtration UE105 indoor operation of the measurement data corresponding. 图20示意了UE 105可以执行以执行这种室内过滤的示例过程2000。 FIG 20 illustrates a UE 105 may be executed to perform the example process 2000 of such filtering chamber. 过程2000可以用于实现图6的一般过程600的至少一部分。 The general process used to implement process 2000 in FIG. 6 may be at least a portion 600. 对于使用过程2000的室内过滤，UE 105接收如上所述的配置信息(框2004)。 For filtering process chamber 2000, UE 105 receives configuration information (block 2004) as described above. 然后，UE 105确定是否可以利用用户定义的存在信息(如在工作或在家用户可选择操作模式)来区分UE 105是否在室内操作(框2008)。 Then, UE 105 can use the presence information to determine whether a user-defined (e.g., selectable modes of operation at work or home user) to distinguish whether the UE 105 in the operating chamber (block 2008). 附加地或备选地，如果UE 105接收到接收电平高于阈值的WiFi信号，则UE 105可以确定其在室内操作(框2012)。 Additionally or alternatively, if the UE 105 receives the WiFi signal receiving level is higher than the threshold value, it may be determined 105 in the operating chamber (block 2012) then the UE. 该阈值可以包括在框2004中获得的配置信息中。 The threshold may include configuration information obtained in block 2004 in. 在运营商网络室内覆盖的情况下，通常使用较小尺寸的基站，其发送功率可以被配置为小于宏基站的发送功率。 In the case where the carrier network indoor coverage, generally smaller dimensions using the base station, its transmission power may be configured to be smaller than a macro base station transmission power. 运营商可以指示(例如经由在框2004获得的配置信息） 这种室内基站的发送功率的阈值。 Operators may indicate (e.g., via the configuration information obtained at block 2004) that the transmission power of an indoor base station threshold value. 如果该阈值低于驻留小区或服务小区的系统信息中指示的发送功率，则UE 105可以确定其在室内操作(框2016)。 If the threshold is lower than the transmission power of cell or system information of the serving cell resides indicated, the UE 105 may determine its operating chamber (block 2016). 当UE 105确定其在室内操作时(框2020)，UE 105拒绝或忽略MDT测量和记录的配置，或者不建立RRC连接以报告所记录的MDT 测量(框2024)。 When the UE 105 determines that it indoor operation (block 2020), arranged to reject or ignore the UE 105 MDT measurement and logging or not to establish an RRC connection MDT measurement report record (block 2024). 相反，当UE 105确定其不在室内操作时（框2028)，UE 105执行MDT测量和记录，或者建立RRC连接以报告所记录的MDT测量(框2032)。 In contrast, when the UE 105 determines that it is not in the operating room (block 2028), UE 105 performs measurements and records MDT, MDT measurement or the RRC connection is established (block 2032) recorded in the report. 在一些情况下，当UE 105操作于驾驶模式时（例如以高移动性操作），运营商可以采用不同的MDT测量配置。  In some cases, when the UE 105 is operating in the driving mode (e.g., high mobility operation), the operator can use different MDT measurement configuration. 例如，当用户将UE设置为驾驶模式时，UE 105可以通知网络其要进入高移动性。 For example, when the user UE to the driving mode, the network may notify the UE 105 to enter their high mobility. 作为响应，网络可以配置针对高移动性的MDT测量。 In response, the network may configure MDT measurement for high mobility. 此外，如果网络对高移动性MDT测量感兴趣，则当UE(例如UE 105)建立RRC连接(存在高移动性指示）时，网络可以选择特定UE，并配置其执行针对高移动性的MDT测量。 In addition, if interested in high mobility network MDT measurement, when the UE (e.g. UE 105) to establish an RRC connection (indicating the presence of high mobility), the UE can select a particular network, and which performs MDT measurement configuration for high mobility . 基于上述考虑，图21示意了可以执行以支持这种驾驶模式处理的示例过程2100。 Based on the above considerations, FIG. 21 illustrates an example process may be performed to support this process 2100 driving mode. 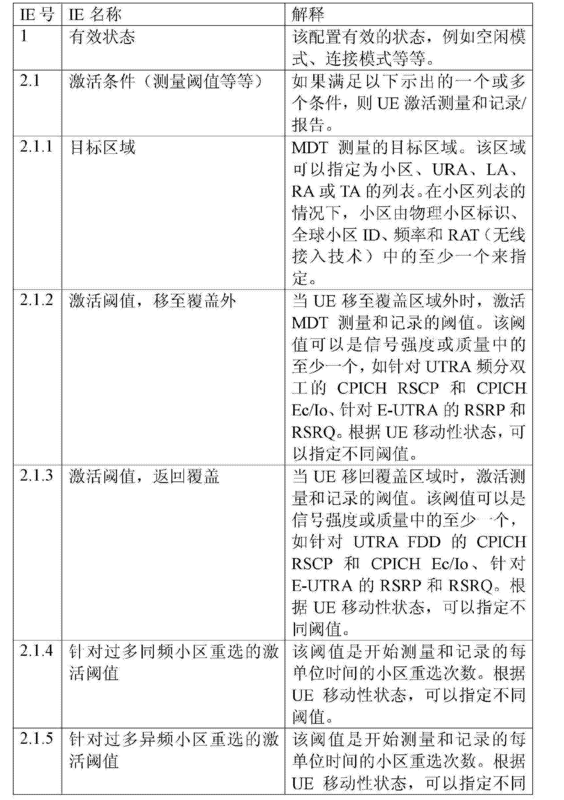 过程2100始于UE 105接收上述MDT配置信息（框2104)。 Process 2100 begins MDT UE 105 receives the configuration information (block 2104). 在所示示例中，在框2104从位于靠近公路并在系统信息中广播MDT配置的一个或多个小区接收MD頂S置信息。 In the illustrated example, the top MD S received location information in one or more cells located near highways from block 2104 and disposed in the MDT broadcast system information. MD頂S置信息包括报告准则，如驾驶模式准则，指示如果UE被设置为驾驶模式，则UE应当建立RRC连接，以及其他报告准则，如报告概率因子。 Top MD S configuration information includes reporting criteria, such as the driving mode criteria, indicating if the driving mode is set to the UE, the UE should establish an RRC connection, and other reporting criteria, such as reporting probability factor. 接下来，如果UE 105被设置为驾驶模式并且满足任何其他报告准则（框2108)，则UE 105建立RRC连接(框2112)。  Next, if the UE 105 and the driving mode is set to satisfy any other reporting criteria (block 2108), the UE 105 establishes an RRC connection (block 2112). 然后，网络提供且UE接收高移动性MDT配置信息（其示例在表1中列出）（框2116)。 Then, the network provides a high mobility and MDT UE receives configuration information (examples of which are listed in Table 1) (block 2116). 然后，释放RRC连接(框2120)，UE能够基于所接收的高移动性配置信息来执行MDT测量和记录。 Then, RRC connection is released (block 2120), UE can be performed based on MDT measurement and recording of high mobility of the received configuration information. 然后，UE 105确定驾驶模式用户输入已被设置，或者以其他方式确定UE 105操作于高移动性条件(框2108)。  Then, UE 105 determines a driving mode has been set to the user input, determine the UE 105 or otherwise operate in a high mobility condition (block 2108). 接下来，为了避免处理暂时覆盖外情况(例如当在电梯中行进时可能发生），UE 105设置定时器(框2112)。 Next, in order to avoid the process is temporarily out of coverage (for example might occur when traveling in an elevator), UE 105 sets a timer (block 2112). 如果定时器到期(框2116)而UE 105仍不处于驾驶模式或者高移动性条件(框2120)，则UE 105可以忽略明显暂时的覆盖外条件(框2124)。 If the timer expires (block 2116) while the UE 105 remains in the driving mode or high mobility condition (block 2120), the UE 105 can ignore significant transient conditions of coverage (block 2124). 然而，如果当定时器到期时(框2120)UE 105仍处于驾驶模式或高移动性条件，则UE 105通过建立RRC连接(例如设置有MDT测量建立原因和驾驶模式指示）来发信号通知驾驶模式设置(框2128)。 If, however, when the timer expires (Block 2120.) UE 105 is still in the driving mode conditions or high mobility, the UE 105 signals the driver by establishing an RRC connection (e.g., MDT measurement establishment cause is provided with a driving mode and indication) to send mode is set (block 2128). 然后，UE 105接收MDT测量和报告/记录配置(设置有合适的驾驶模式/高移动性信息单元（IE))(框2132)。 Then, UE 105 receives MDT measurement and reporting / logging configuration (provided with a suitable driving mode / high mobility information elements (IEs)) (block 2132). 备选地，当已经配置了MDT测量时，如果设置了驾驶模式(或高移动性），则UE 105可以决定不服从所配置的MDT测量/报告。 Alternatively, when the MDT measurement has been configured, if the driving mode is set (or high mobility), the UE 105 may decide not to obey MDT measurement / reporting configuration. 容易认识到，UE 105可以被配置为执行图6、8A-B、10-12、14、15和17-21中示意的任何、一些、全部过程或过程部分。  readily appreciated, UE 105 may be configured to perform FIGS 6,8A-B, any, some, all process or 10-12,14,15 and 17-21 schematically part. 类似地，可以认识到，提供基站功能的网络单元（如eNB 305)可以被配置为执行图7、13和15中示意的任何、一些、全部过程或过程部分。 Any, some, all or part of the process procedure Similarly, it is appreciated that the functions of the base station provides network elements (e.g., eNB 305) may be configured to perform in FIGS. 7, 13 and 15 illustrated. 表1中列出了具有可以经由系统信息、RRC信令(例如RRC连接重新配置消息）、测量控制消息等等传送的3GPP信息单元（IE)形式的示例MD頂S置信息。  Table 1 having via system information, RRC signaling (e.g., RRC connection reconfiguration message) example, a measurement control message transmitted information unit like 3GPP (IE) in the form of top MD S configuration information. 一般地，一但经由表1中的MDT IE配置了MDT测量(例如在连接模式下），则即使UE 105进入空闲模式，该配置仍有效。 Generally, but via a MDT IEs in Table 1 arranged MDT measurement (e.g., in the connected mode), even if the UE 105 enters the idle mode, this configuration is still valid. 以下是使用表1中的MDT IE来配置3GPP通信系统100中的MDT测量的一些示例。  The following Table 1 are used to configure some examples MDT IEs MDT measurement in 100 3GPP communication system. 示例1:为了检测空闲模式覆盖问题，广播系统信息可以包括MDTIE 2.1.2(激活阈值，移至覆盖外)或2.1.3(激活阈值，返回覆盖)作为MDT测量和记录的激活条件。  Example 1: coverage problems in order to detect an idle mode, the broadcast system information may include MDTIE 2.1.2 (activation threshold to move out of coverage) or 2.1.3 (activation threshold, back to coverage) activation condition as MDT measurement and logging . 此外，系统信息可以包括MDT IE 2.2.2 (去激活阈值，移至覆盖外）、2.2.3 (去激活阈值，返回覆盖)和2.2.7(测量和记录的持续时间）作为测量和记录的去激活条件。 Further, the system information may include MDT IE 2.2.2 (deactivation threshold, move out of coverage), 2.2.3 (deactivation threshold, return coverage) and 2.2.7 (the duration of the measurement and recording) is measured and recorded as deactivation conditions. 系统信息还可以包含MDT IE 2.2.7(测量和记录的持续时间），以限制UE执行MDT测量和记录的次数。 The system information may further comprise MDT IE 2.2.7 (the duration of the measurement and recording), to limit the number of records and perform MDT measurement UE. 可以包括MDT IE 3.1(事件标识）、3.2(作为有效覆盖外持续时间的报告范围）和3.3(报告概率因子）以用于报告。 It may include MDT IE 3.1 (event ID), 3.2 (as an effective duration of coverage reporting range) and 3.3 (reporting probability factor) for reporting. 作为示意性示例，MDT IE 3.1(事件标识）可以被设置为覆盖外或受限驻留，MDTIE 3.2(作为有效覆盖外持续时间的报告范围）可以被设置为3至10分钟。 As an illustrative example, MDT IE 3.1 (event ID) may be provided to cover the outer or limited camping, MDTIE 3.2 (as an effective duration of coverage reporting range) may be set to 3 to 10 minutes. 示例2:为了检测空闲模式移动性问题，系统信息可以包括MDT IE2.1.4(针对过多同频小区重选的阈值）、2.1.5(针对过多异频小区重选的阈值)或2.1.6(针对过多RAT频率间小区重选的阈值)作为MDT测量和记录的触发条件。  Example 2: In order to detect an idle mode mobility problem, the system information may include MDT IE2.1.4 (too much for intra-frequency cell reselection threshold), 2.1.5 (the threshold value for the excess of the inter-frequency cell reselection) or 2.1.6 (against excessive inter-RAT cell reselection threshold frequency value) as a trigger condition MDT measurement and logging. 系统信息可以包含MDT IE 2.2.7(测量和记录的持续时间），以限制UE执行MDT测量和记录的次数。 The system information may contain MDT IE 2.2.7 (the duration of the measurement and recording), to limit the number of records and perform MDT measurement UE. 系统信息还可以包括MDT IE 4.1(事件标识）、4.3(定位概率因子)和4.8(定位请求模式）以获取问题区域的位置信息。 The system information may further include MDT IE 4.1 (event ID), 4.3 (probability factor positioning) and 4.8 (mode positioning request) to acquire the position information of problem areas. 在示意性示例中，MDT IE 4.1(事件标识)可以被设置为超过小区重选阈值，MDT IE 4.8(定位请求模式)可以被设置为MO-LR(定位测量）。 In the illustrative example, MDT IE 4.1 (event ID) may be provided to a cell reselection threshold is exceeded, MDT IE 4.8 (positioning mode request) may be provided as MO-LR (positioning measurement). 示例3:当已经标识了问题区域时，系统信息可以包含MDT IE 2.1.1(目标区域）， MDT IE 4.1(事件标识）可以被配置为"进入指定区域"，并具有合适的概率因子(MDT IE 4.3(定位概率因子））和合适的信号强度阈值(MDT IE 4.4(报告范围DJDT IE 4.8(定位请求模式)可以被设置为"RRC连接建立"。当UE建立RRC连接时，网络可以使用RRC连接重新配置消息来配置MDT测量和记录。例如，消息可以包括MDT IE5.2(辅助数据）以传送辅助数据。  Example 3: When the problem area has been identified, the system information may contain MDT IE 2.1.1 (target area), MDT IE 4.1 (event ID) may be configured as a "designated area", and with a suitable probability factor (MDT IE 4.3 (positioning probability factor)) and an appropriate signal strength threshold (MDT IE 4.4 (reporting range DJDT IE 4.8 (positioning request mode) can be set to "RRC connection Setup." when the UE establishes an RRC connection, the network You may be used RRC connection reconfiguration message and to configure MDT measurement record. for example, the message may include MDT IE5.2 (auxiliary data) to transmit the auxiliary data. 示例4:系统信息可以包括:MDT IE 2、MDT IE 4.1(事件标识)设置为进入覆盖区域、MDT IE 4.3(定位概率因子）、MDT IE 4.4(报告范围）设置为3至10分钟、以及MDT IE 4.8 (定位请求模式）设置为M0-LR(定位测量）。  Example 4: The system information may include: MDT IE 2, MDT IE 4.1 (event ID) is set to enter the coverage area, MDT IE 4.3 (positioning probability factor), MDT IE 4.4 (reporting range) is set to 3-10 minutes and MDT IE 4.8 (positioning request mode) is set to M0-LR (positioning measurement). 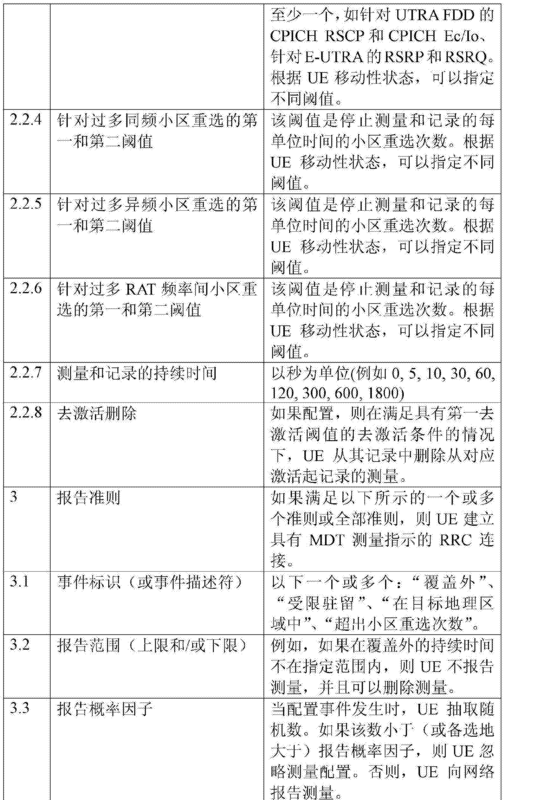 当UE找到合适小区时，UE可以发起M0-LR请求。 When the UE has found a suitable cell, UE may initiate M0-LR request. 图22是能够实现这里公开的设备和方法的示例处理系统2200的框图。  FIG. 22 is a block 2200 enables the apparatus and method disclosed herein is an example processing system. 处理系统2200可以例如是服务器、个人计算机、个人数字助理(PDA)、智能电话、因特网设备或任何其他类型的计算设备。 Processing system 2200 may for example be a server, personal computer, personal digital assistant (PDA), a smart phone, an Internet appliance or any other type of computing device. 本示例的系统2200包括:处理器2212,如通用可编程处理器。  The system 2200 of the present example comprises: a processor 2212, such as a general purpose programmable processor. 处理器2212包括本地存储器2214,并执行本地存储器2214和/或另一存储器设备中存在的编码指令2216。 The processor 2212 includes a local memory 2214, and executes coded instructions local memory 2214 and / or the presence of another memory device 2216. 处理器2212可以执行机器可读指令以实现图6、7、8A-B、10-15和17-21中表示的过程。 The processor 2212 may execute machine-readable instructions to implement FIG 6,7,8A-B, 10-15, and 17-21 processes represented. 处理器2212 可以是任何类型的处理单元，如来自Intel® Centrino®微处理器族、Intel® Pentium®微处理器族、Intel® Itanium®微处理器族、和/或intelXScale®微处理器族的一个或多个微处理器、来自ARM®微控制器族、PIC®微控制器族的一个或多个微控制器等等。 The processor 2212 may be any type of processing unit, such as the family of microprocessors from the Intel® Centrino®, Intel® Pentium® family of microprocessors, Intel® Itanium® family of microprocessors, and / or family of microprocessors intelXScale® one or more microprocessors, microcontrollers from ARM® family, a family PIC® microcontroller or more microcontrollers and the like. 当然， 来自其他族的其他处理器也适用。 Of course, other processors from other families are also suitable. 处理器2212经由总线2222与包括易失性存储器2218和非易失性存储器2220的主存储器通信。  The processor 2212 communicates with a main memory bus 2222 including a volatile memory 2218 and nonvolatile memory 2220 via. 易失性存储器2218可以由以下实现:静态随机存取存储器(SRAM)、同步动态随机存取存储器(SDRAM)、动态随机存取存储器(DRAM)、RAMBUS动态随机存取存储器(RDRAM) 和/或任何其他类型的随机存取存储器设备。 The volatile memory 2218 may be implemented by the following: static random access memory (SRAM), synchronous dynamic random access memory (SDRAM), Dynamic Random Access Memory (DRAM), RAMBUS Dynamic Random Access Memory (RDRAM) and / or any other type of random access memory device. 非易失性存储器2220可以由以下实现：闪存和/或任何其他期望类型的存储器设备。 The nonvolatile memory 2220 may be implemented by the following: a flash memory and / or any other desired type of memory device. 对主存储器2218、2220的访问典型地由存储器控制器(未示出)控制。 2218,2220 access to the main memory is typically controlled by a memory controller (not shown). 处理系统2200还包括接口电路2224。  The processing system 2200 further includes an interface circuit 2224. 接口电路2224可以由任何类型的接口标准实现，如以太网接口、通用串行总线(USB)、和/或第三代输入/输出（3GI0)接口。 The interface circuit 2224 may be implemented by any type of interface standard, such as an Ethernet interface, a universal serial bus (USB), and / or a third generation input / output (3GI0) interface. 一个或多个输入设备2226连接至接口电路2224。  One or more input devices 2226 are connected to the interface circuit 2224. 输入设备2226允许用户向处理器2212输入数据和命令。 The input device 2226 allows a user to enter data and commands to the 2212 processor. 输入设备可以由以下实现:例如键盘、鼠标、触摸屏、轨迹板、轨迹球、 等值点和/或语音识别系统。 The input device may be implemented by the following: a keyboard, a mouse, a touch screen, track pad, track ball, equivalent points and / or a voice recognition system. 一个或多个输出设备2228也可以连接至接口电路2224。  One or more output devices 2228 may also be connected to the interface circuit 2224. 输出设备2228可以由以下实现:例如显示设备（例如液晶显示器、阴极射线管显示器(CRT))、打印机和/或扬声器。 Output device 2228 may be implemented by the following: for example, a display device (e.g. a liquid crystal display, a cathode ray tube display (the CRT)), a printer and / or speakers. 因此，接口电路2224典型地包括图形驱动卡。 Thus, the interface circuit 2224 typically includes a graphics driver card. 接口电路2224还包括通信设备（如调制解调器或网络接口卡），以便于经由网络(例如以太网连接、数字订户线(DSL)、电话线、同轴电缆、蜂窝电话系统等等)与外部计算机交换数据。  The interface circuit 2224 also includes a communication device (e.g., a modem or network interface card), in order via a network (e.g., an Ethernet connection, digital subscriber line (DSL), telephone line, coaxial cable, a cellular telephone system, etc.) and external computer to exchange data. 处理系统2200还包括用于存储软件和数据的一个或多个大容量存储设备2230。  The processing system 2200 further comprises a storing software and data for one or more mass storage devices 2230. 这种大容量存储设备2230的示例包括：软盘驱动器、硬盘驱动器、CD驱动器和数字通用光盘(DVD)驱动器。 Such mass storage devices 2230 include example: a floppy disk drives, hard drives, CD drives, and digital versatile disk (DVD) drives. 作为在如图22的处理系统之类的系统中实现这里描述的方法和/或设备的备选， 可以在如处理器和/或ASIC(专用集成电路)之类的结构中嵌入这里描述的方法和/或设备。  As an alternative approach described herein implemented in a processing system of FIG 22 such systems and / or devices, may be embedded in a structure such as where the processor and / or an ASIC (application specific integrated circuit) or the like in methods described and / or devices. 最终，尽管这里已经描述了特定示例方法、设备和制造品，但是本专利的覆盖范围不限于此。  Finally, although there have been described certain example methods, apparatus and articles of manufacture, the scope of coverage of this patent is not limited thereto. 相反，本专利覆盖字面上或根据等同原则落入所附权利要求范围内的所有方法、 设备和制造品。 On the contrary, this patent covers all fall literally or methods, apparatus and articles of manufacture within the scope of the appended claims in accordance with the doctrine of equivalents. 1. 一种用于用户设备UE(105)执行测量的方法，所述方法包括： 经由无线资源控制RRC消息，从网络（100)接收配置信息，所述配置信息包括测量激活准则和位置请求准则，其中，所述测量激活准则标识UE执行对网络传输的信号强度的测量和记录的条件，所述位置请求准则标识UE执行定位测量的条件，所述配置信息还包括测量去激活准则，其中，所述测量去激活准则标识UE停止对网络传输的信号强度进行测量的条件； 响应于检测到所述测量激活准则和所述位置请求准则，确定对网络传输的信号强度的测量和记录以及相应的UE的定位测量；以及周期性地记录信号强度测量，并且当无线环境变得劣于阈值时，周期性地执行定位测量。 1. A method for a user equipment UE (105) performing the measurement, the method comprising: via a radio resource control (RRC) message, receiving configuration information from the network (100), the configuration information includes a measurement location request activation criteria and guidelines wherein the activation criteria identifies the UE performs measurement on the condition of the transmission signal strength of the network measured and recorded, the location request identification criteria UE positioning measurements execution condition, the configuration information further comprises a measurement deactivation criteria, wherein the deactivation criteria measurement conditions identified UE stops transmission of the signal strength of the network is measured; in response to detecting the activation of the measurement criteria, and the location request criteria, determines the signal strength of the transmission network and the corresponding measured and recorded UE positioning measurements; and signal strength measurements recorded periodically, and when the radio environment becomes worse than a threshold value, periodically perform positioning measurements. 2. 根据权利要求1所述的方法，其中，所述测量激活准则包括第一阈值。 The method according to claim 1, wherein said measurement criteria comprises a first activation threshold. 3. 根据权利要求2所述的方法，其中，所述测量激活准则包括：当下行链路导频信号强度、下行链路导频信号质量或另一评估度量中的至少一个变为比第一阈值差时，激活定位测量。 The method according to claim 2, wherein said measurement criteria comprises activation: the downlink pilot signal strength, pilot signal quality of a downlink or another evaluation metric becomes higher than at least one of the first difference threshold, activates the positioning measurement. 4. 根据权利要求1至3中任一项所述的方法，还包括:基于从网络接收的配置信息中包括的激活条件，激活定位测量的执行。 4. A method according to any one of claim 3, further comprises: performing an activation condition based on the configuration information from the network comprises received, activates the positioning measurements. 5. -种用于提供配置信息的方法，包括： 准备配置信息，以将UE(105)配置为执行信号强度测量和定位测量，所述配置信息包括测量激活准则和位置请求准则，其中，所述测量激活准则标识UE执行对网络传输的信号强度的测量和记录的条件，所述位置请求准则标识UE执行定位测量的条件，所述配置信息还包括测量去激活准则，其中，所述测量去激活准则标识UE停止对网络传输的信号强度进行测量的条件；以及经由无线资源控制(RRC)消息，向UE发送所述配置信息。 5 - method for providing configuration information, comprising: preparing configuration information to the UE (105) configured to perform signal strength measurements and positioning measurements, the configuration information includes a measurement location request activation criteria and guidelines, wherein the said measuring activation criteria identifies the UE performs signal strength measurements and the network transmission of the recording conditions, the location request execution condition criteria identifying UE positioning measurements, the configuration information further comprises a measurement deactivation criteria, wherein said measurement to activation criteria identifies the UE stops transmission conditions on the signal strength of the network is measured; and via radio resource control (RRC) message, sending the configuration information to the UE. 6. 根据权利要求5所述的方法，其中，所述测量激活准则包括第一阈值。 6. The method according to claim 5, wherein said measurement criteria comprises a first activation threshold. 7. 根据权利要求6所述的方法，其中，所述UE(105)当下行链路导频信号强度、下行链路导频信号质量或另一评估度量中的至少一个变为比第一阈值差时，激活定位测量。 The method according to claim 6, wherein, (105) UE downlink pilot signal strength of the pilot, downlink pilot signal or another quality evaluation metric becomes at least a value greater than a first threshold the difference, activated positioning measurements. 8. -种用于执行测量的设备，包括处理器，所述处理器被配置为执行根据权利要求1至4中任一项所述的方法。 8. - The method according to any one of claims 1 to 4 kinds for performing measurements, comprising a processor configured to perform the claims. 9. 一种用于提供配置信息的设备，包括处理器，所述处理器被配置为执行根据权利要求5至7中任一项所述的方法。 9. An apparatus for providing configuration information, including a processor configured to perform the method of any one of 5 to 7 according to claim. ES2368385T3 (en) 2009-01-29 2011-11-16 Lg Electronics Inc. Signal transmission scheme for efficient management of common enhanced dedicated channel.